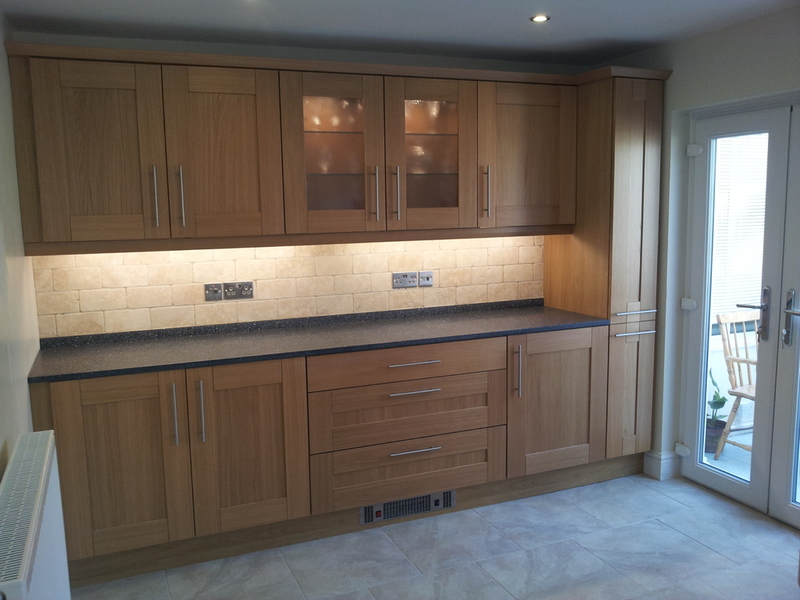 Complete kitchen refit including lighting and tiling. 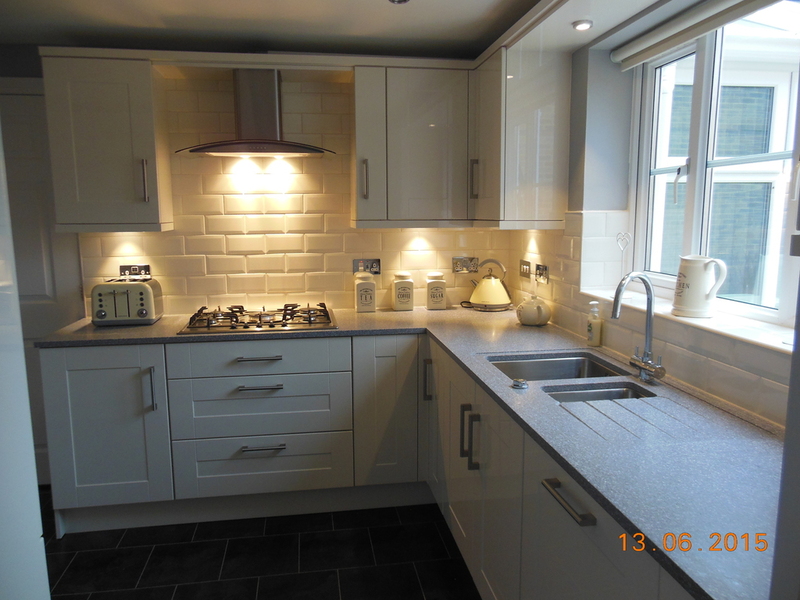 Ivory gloss shaker style units from the Gallery range combined with Minerva Peak Stone work surfaces. 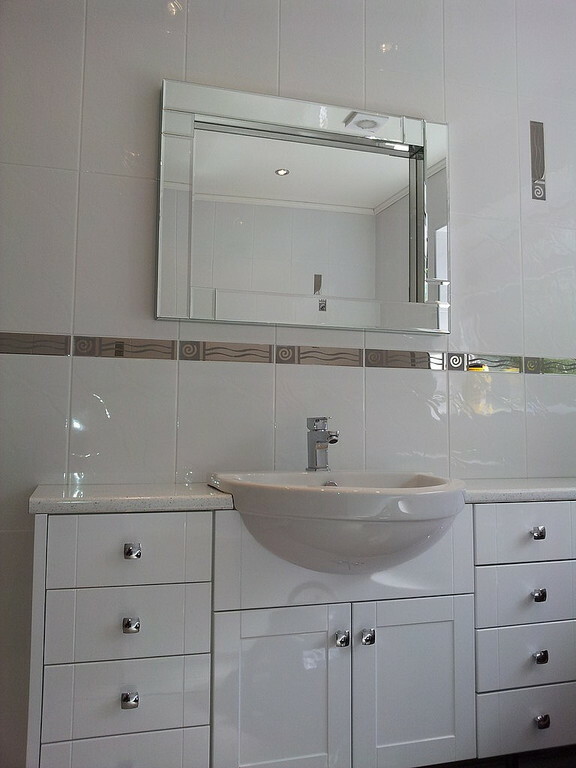 Completed bathroom with Granada furniture from the LINDO collection. 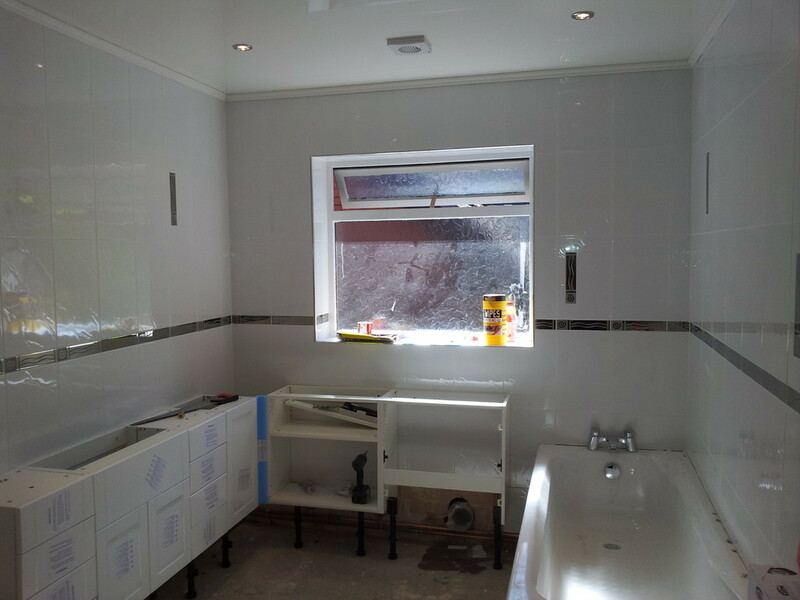 A PVC ceiling was installed with chrome detail and chrome LED down lighters. 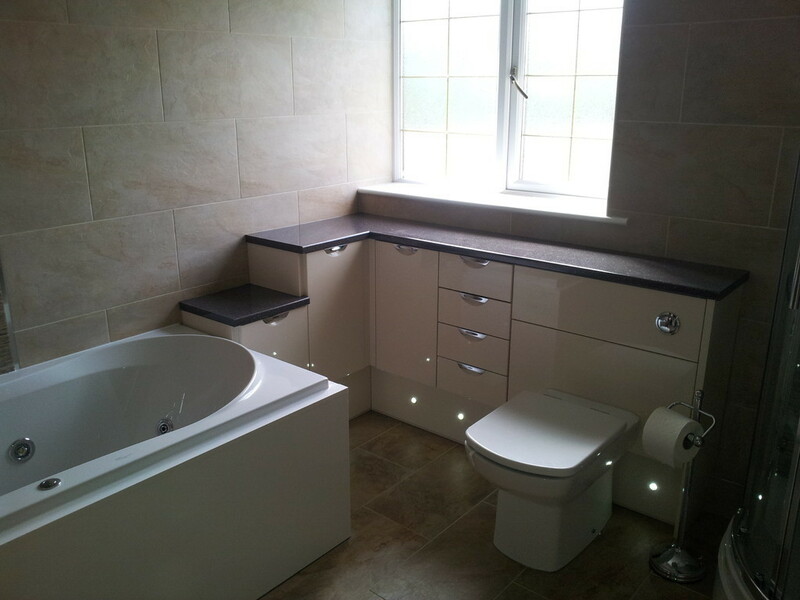 The bath was fitted with a feature step containing LED mood lighting. 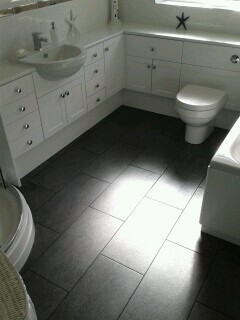 The floor and walls are tiled and vertical mosiac borders added to great effect. 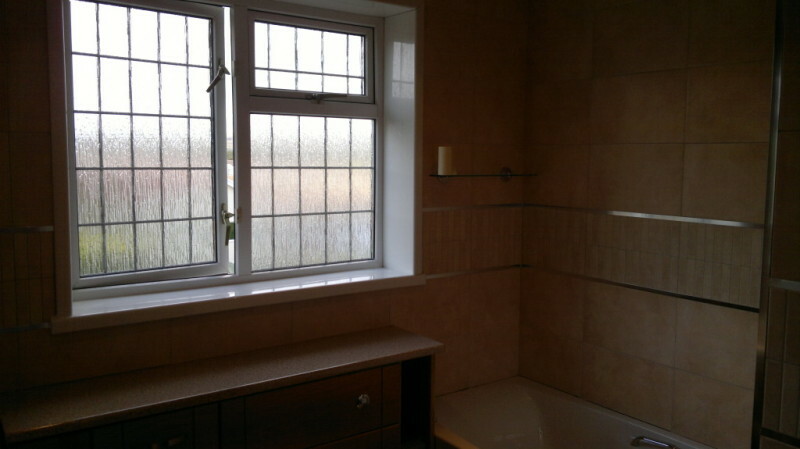 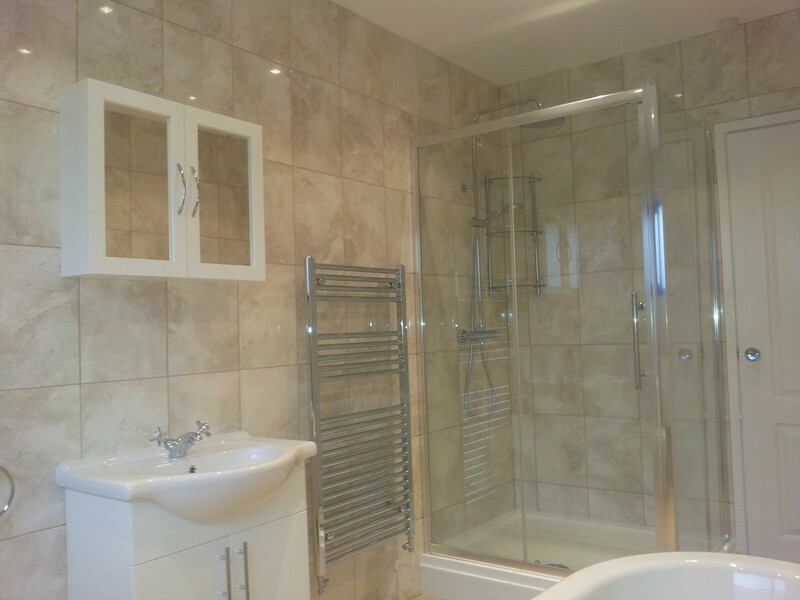 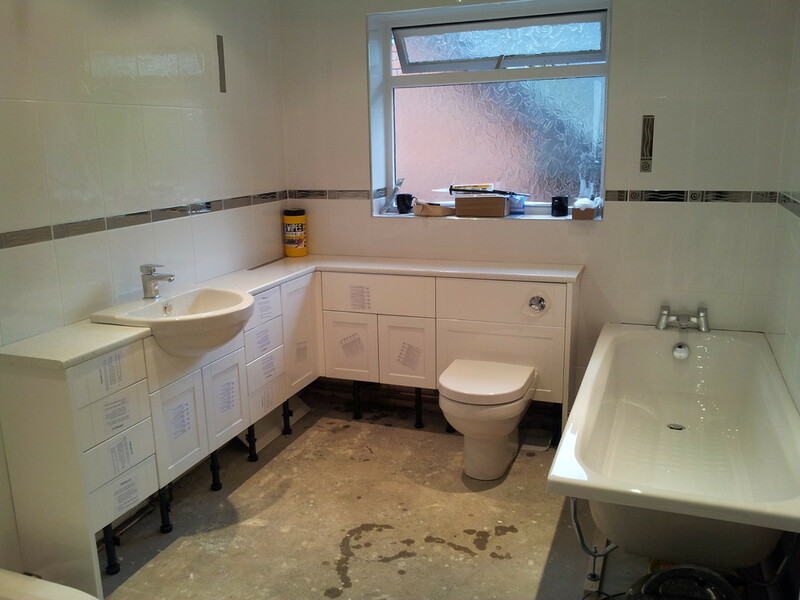 Large project where the Utility room was modernised and the exisitng bathroom was converted to a wetroom. 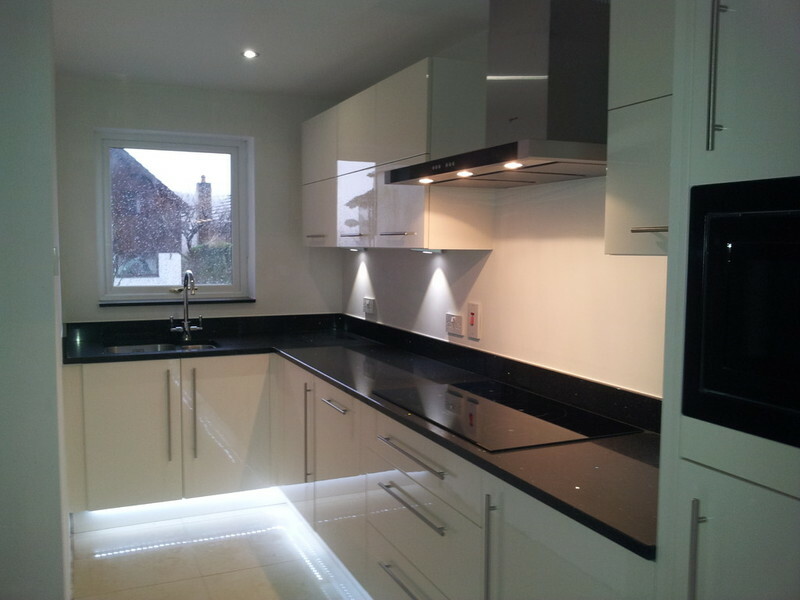 PVC ceilings we fitted to both rooms, with chrome LED down lighters. 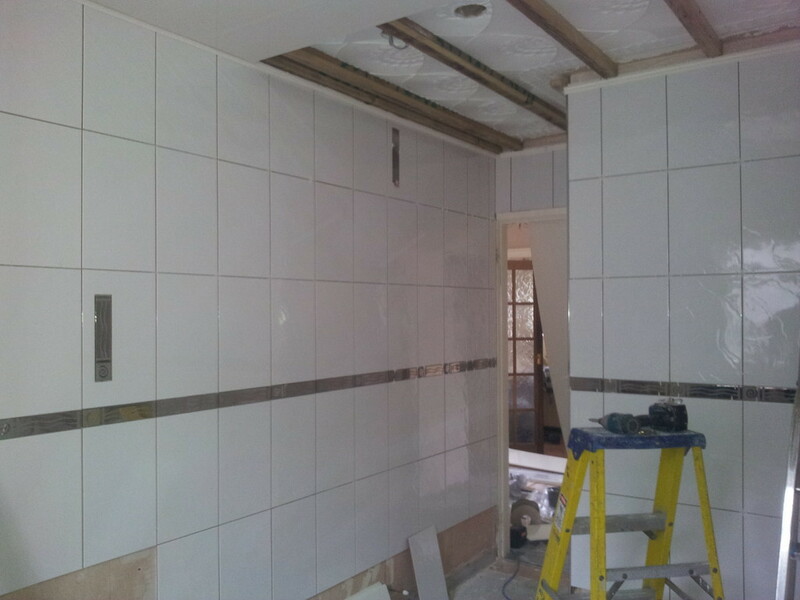 The foors and walls were tiled. 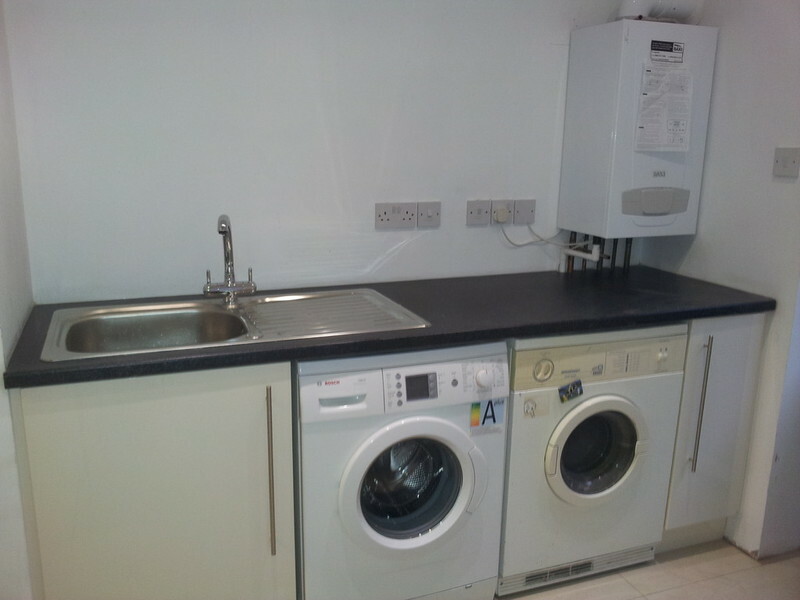 Fiora Gloss Anthracite fitted furniture from the LINDO range was installed in the Wetroom, and Woodbury gloss anthracite kitchen cabinets in the Utility room. 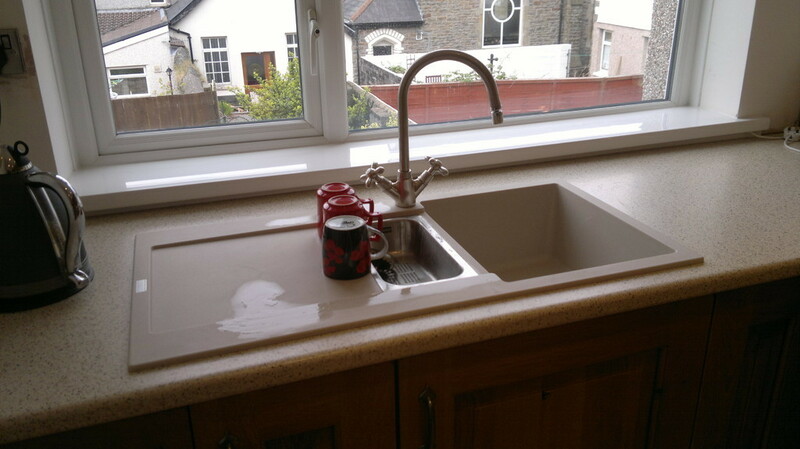 The worksurfaces are Minerva and are same for both rooms. 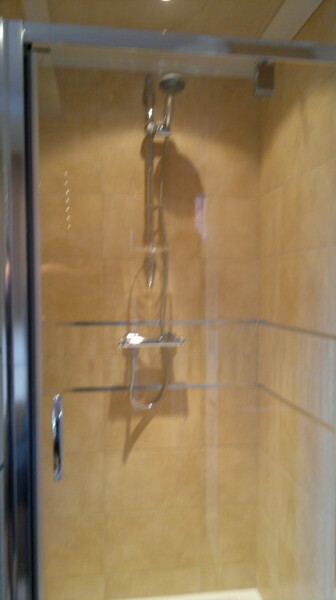 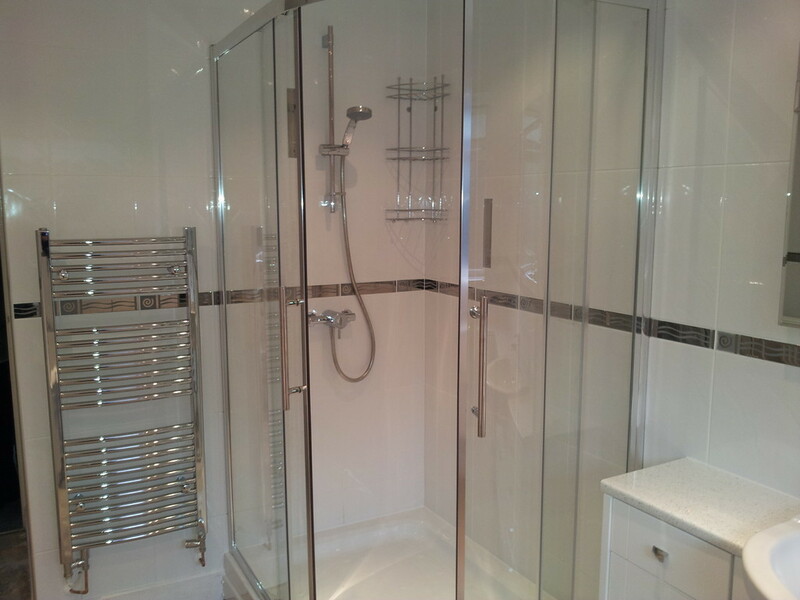 A new shower valve with drench head and hand set, and a glass shower screen completes the look. 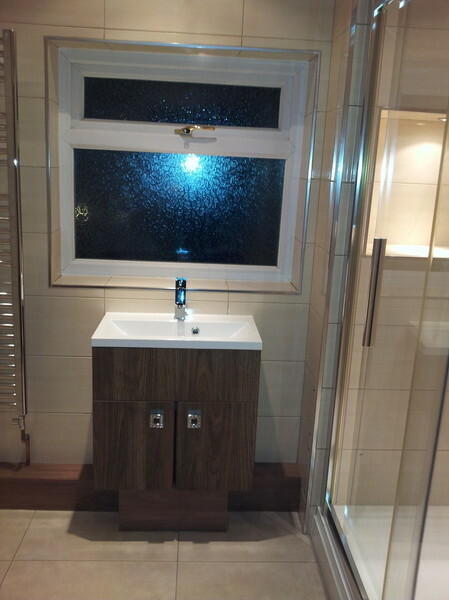 Ensuite with a free standing bath and fitted Ionian Oak furniture from the Aquadi range. 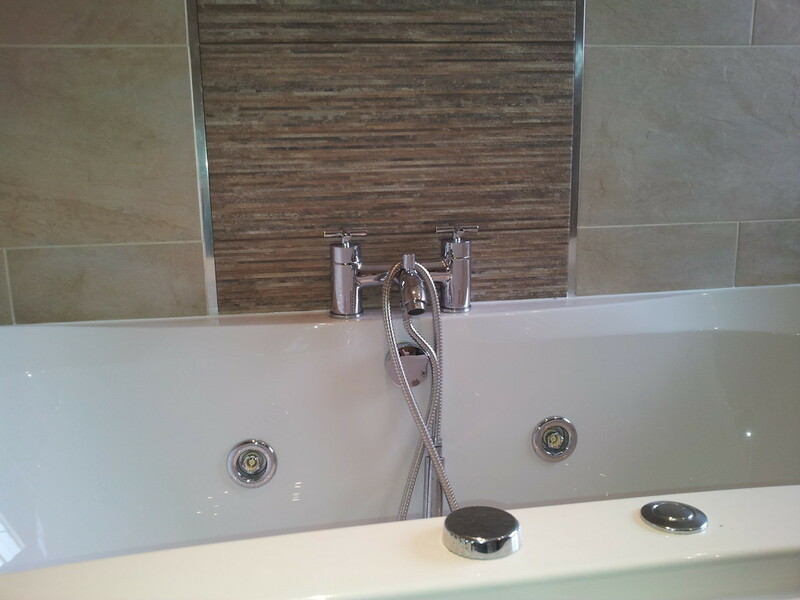 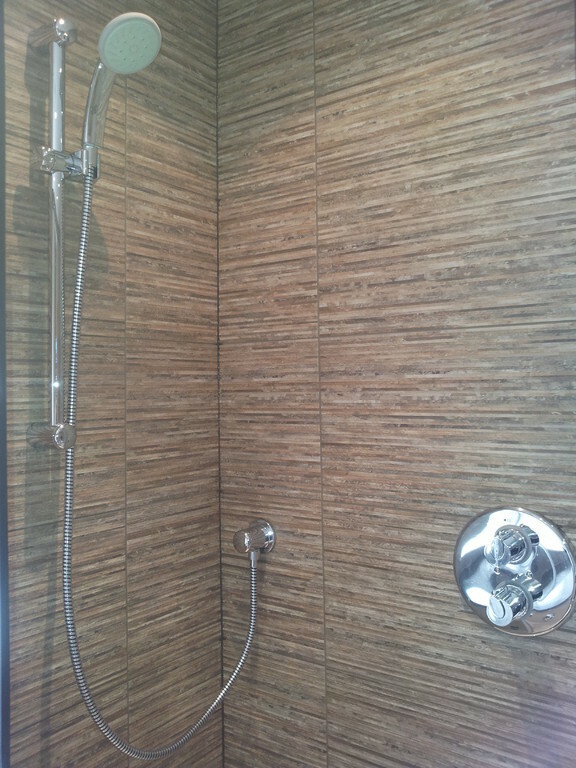 The walls were clad with travertine shower panels and the fooring is Aquastep Pure oak PVC laminate. 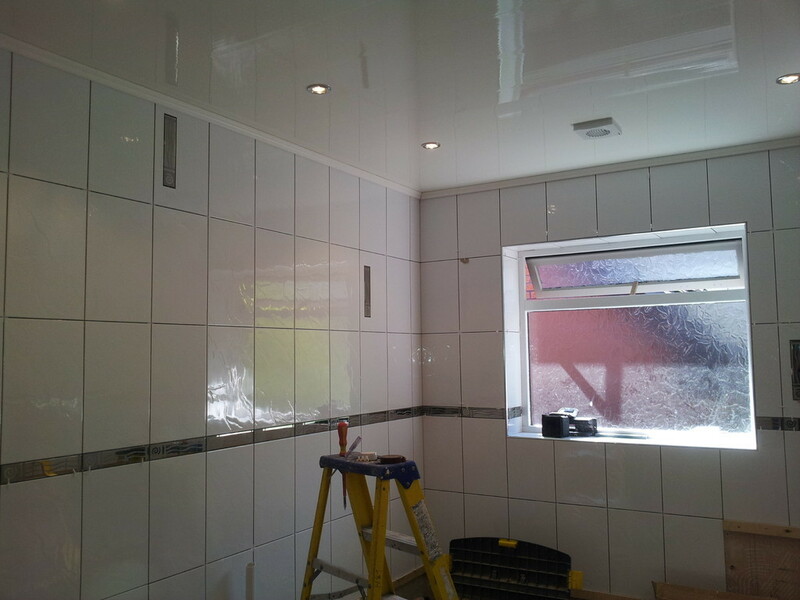 A PVC ceiling was installed with chrome LED down lighters. 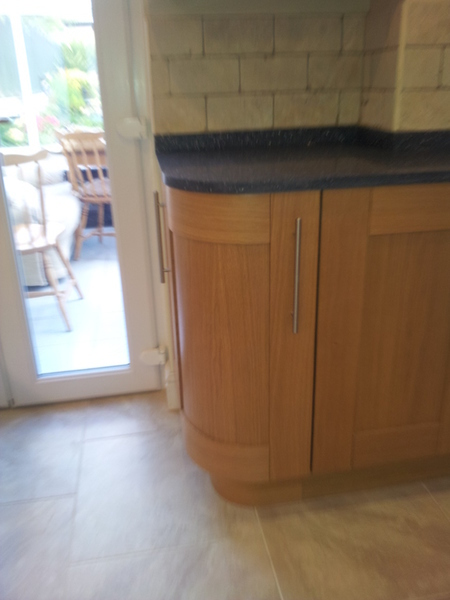 Recently completed kitchen with the Minesota Avola door and Natural Ash PVC edged work surfaces. 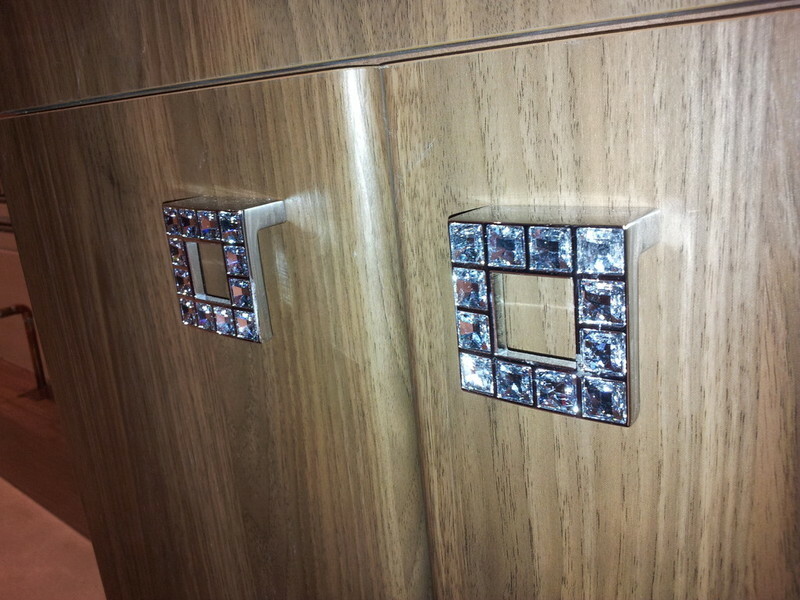 Matching Minesota back panels complete the look. 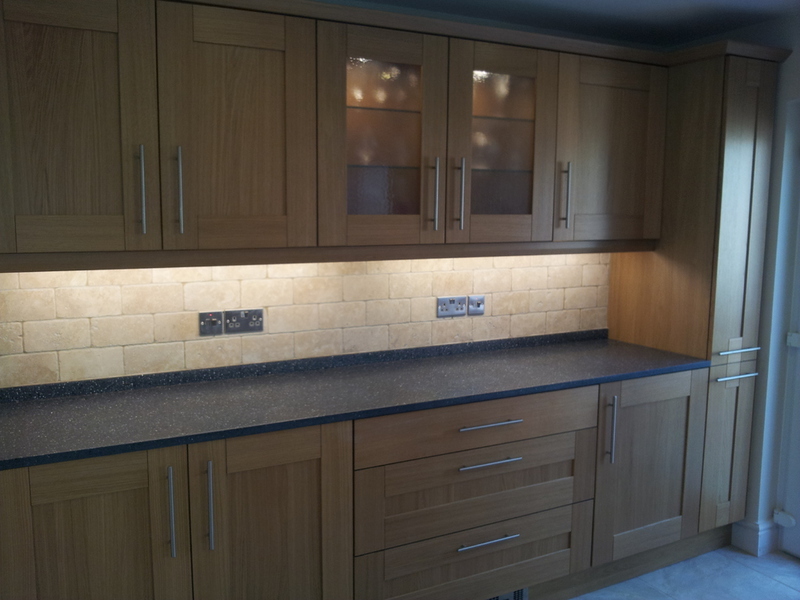 A solid wood Oak shaker kitchen from Symphony installed with MINERVA solid worksurfaces and splashbacks. 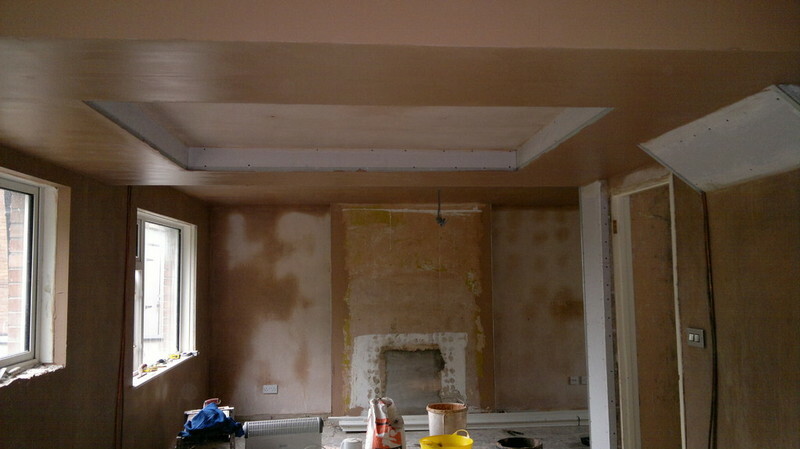 The ceilings were replastered and LED down lighters installed. 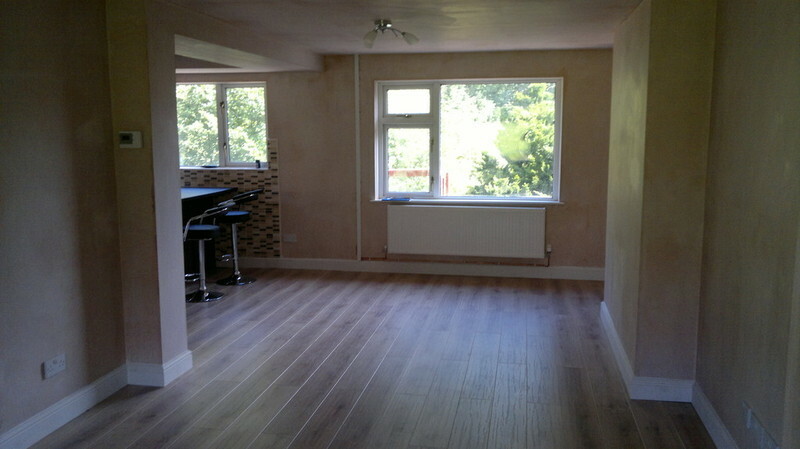 A new set PVC french doors were fitted and the floors and walls tiled. 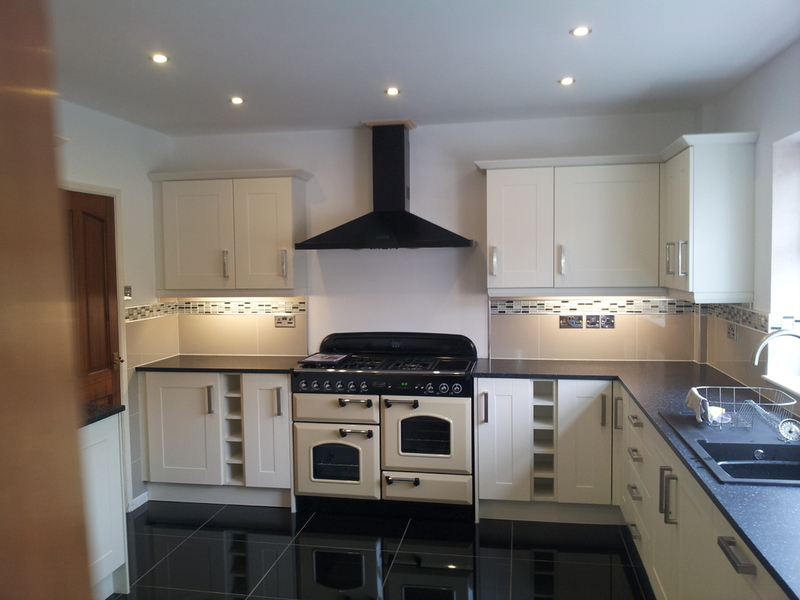 Brushed steel electrical accesories and under cupboard lighting as well as a Rangemaster range cooker and matching hood complete the kitchen. 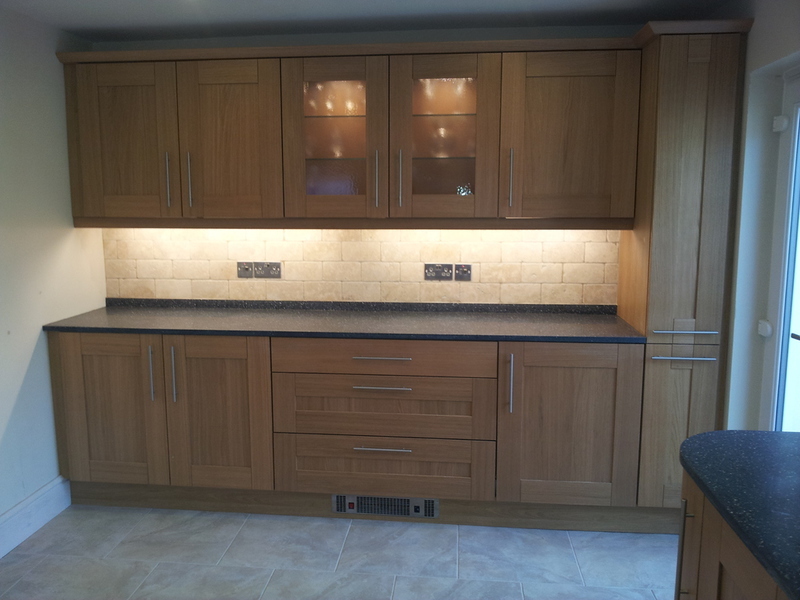 A large kitchen installation where the ceilings were replastered and LED down lighters installed. 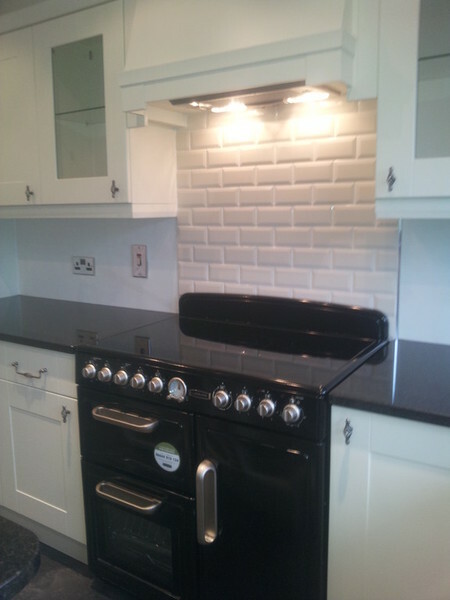 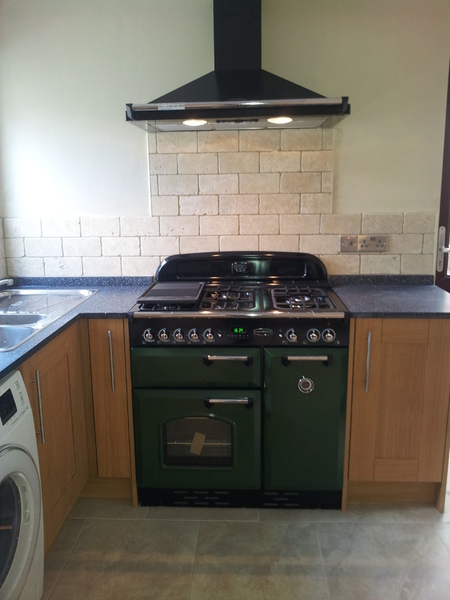 The floors and splashbacks on the walls were tiled, and a Rangemaster range cooker and matching extractor hood installed. 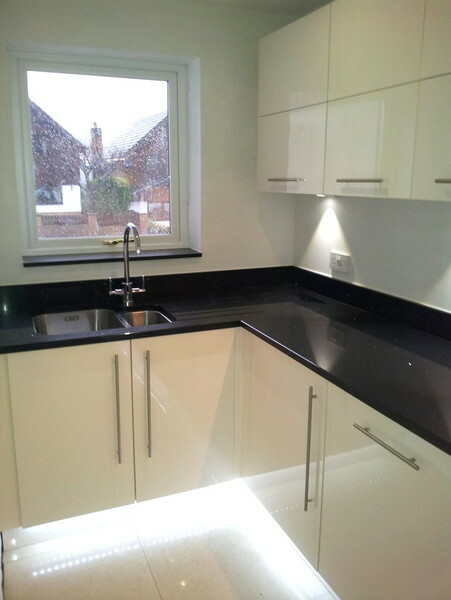 The range of kitchen is the EDMONTON with MINERVA solid worksurfaces and a Franke Maris sink unit. 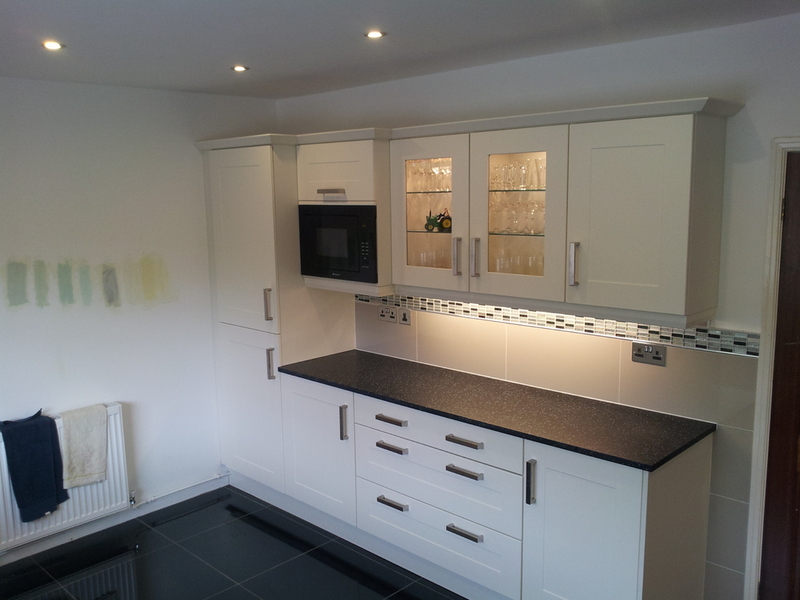 Boston Ivory Kitchen Wrapped with 40mm Palisander worktops and blender panels. 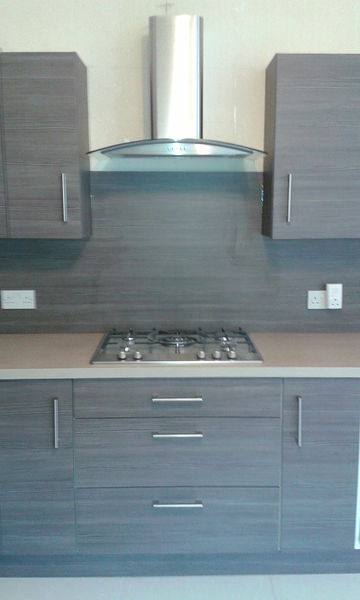 Palisander upstands and a clear glass splashback behind the hob. 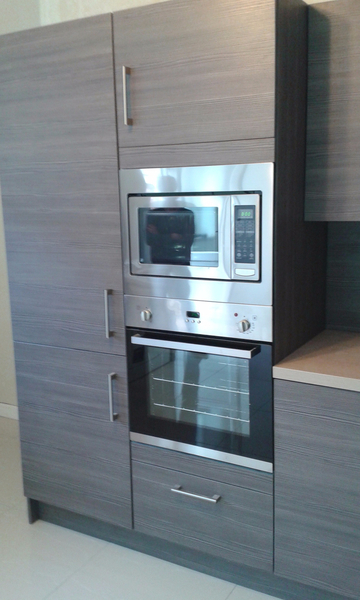 Bosch appliances include single oven, built in microwave grill and gas hob. 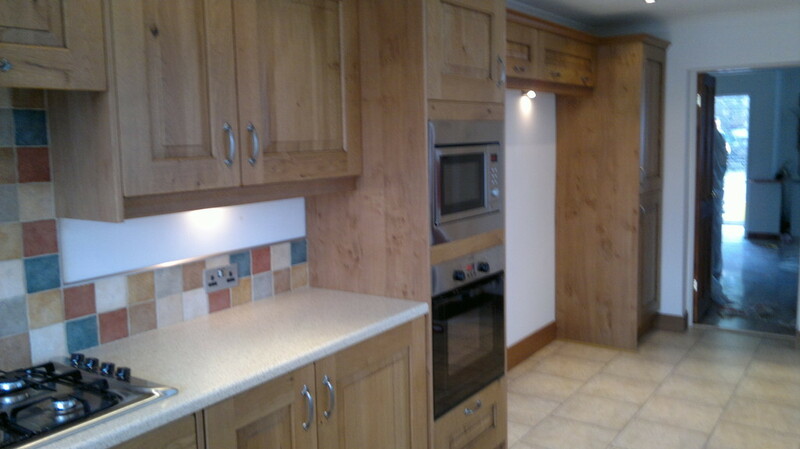 An merican fridge freezer was incorporated into the design. 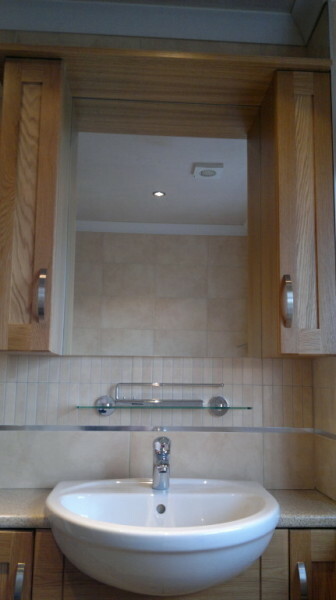 New LED down lighters fitted into the new ceiling, brushed steel electrical accessories and LED under cupboard lighting. 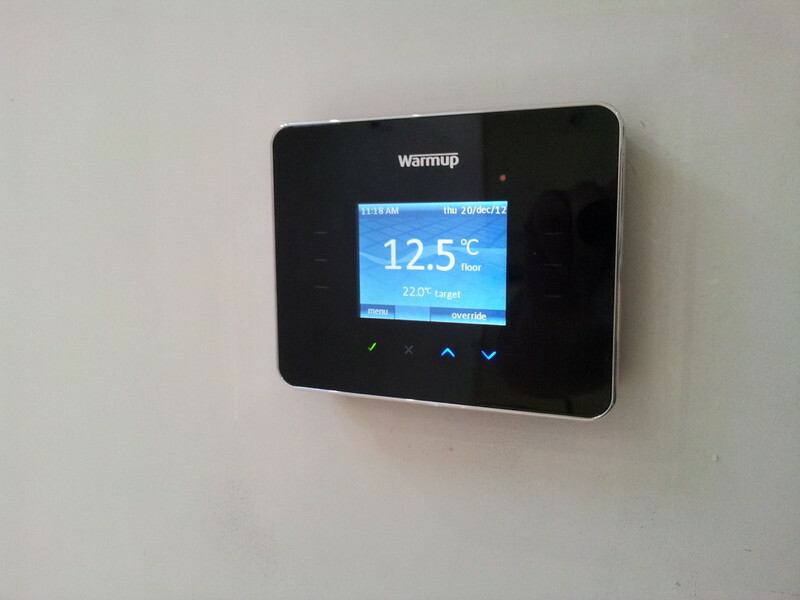 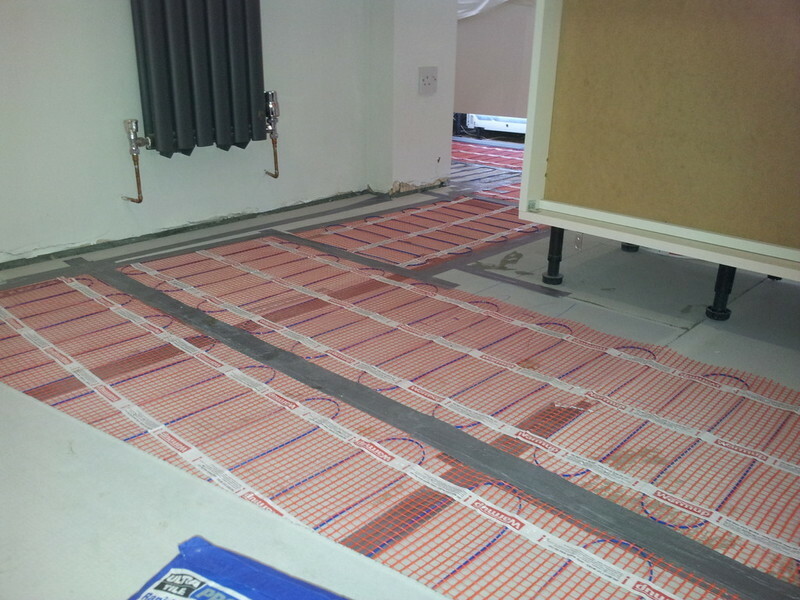 A WARMUP under floor heating system was installed prior to the floor being tiled. 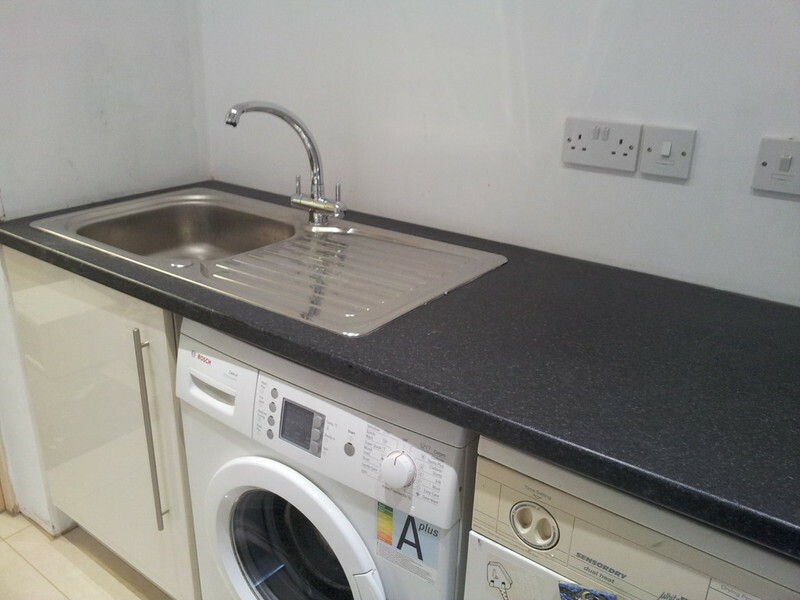 A wine chiller was fitted into the base units and a Franke MARIS fragranite sink unit and tap installed. 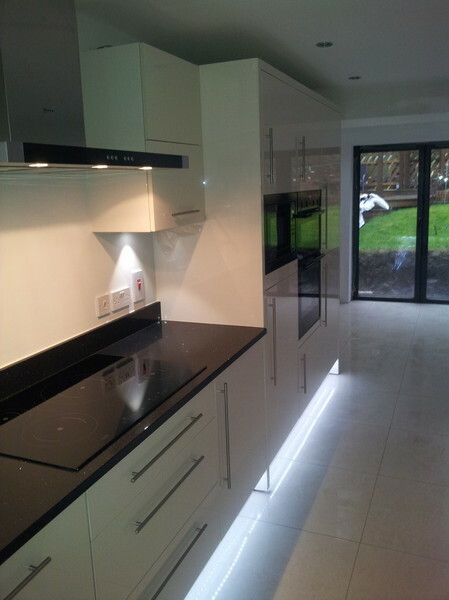 The Georgia Mezzo Kitchen by Symphony framed with 40mm chunky blender panels. 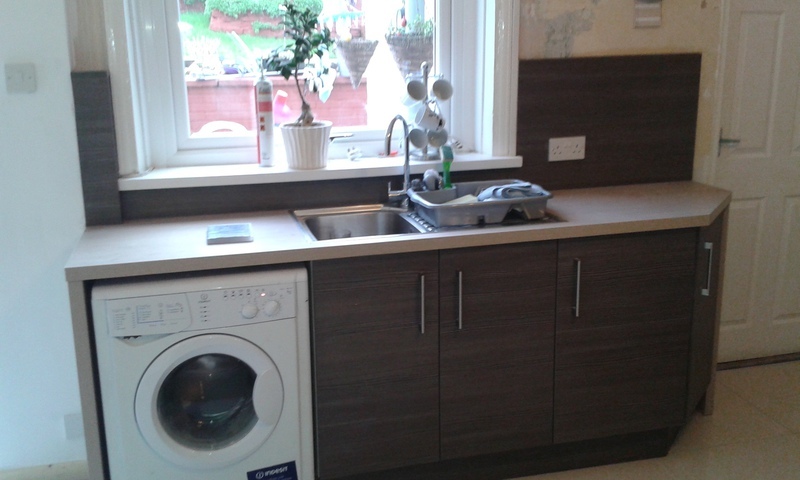 Worksurfaces, upstands and the hob splashback are SILESTONE Tigris Sand and a Rangemaster undermounted sink unit and Rangemaster Tap. 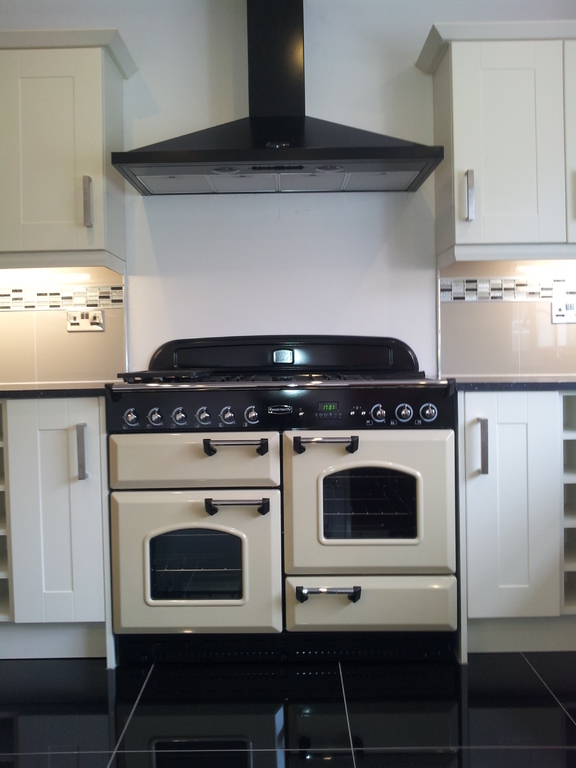 A LUCE double oven and a Bosch gas hob with flame failure. 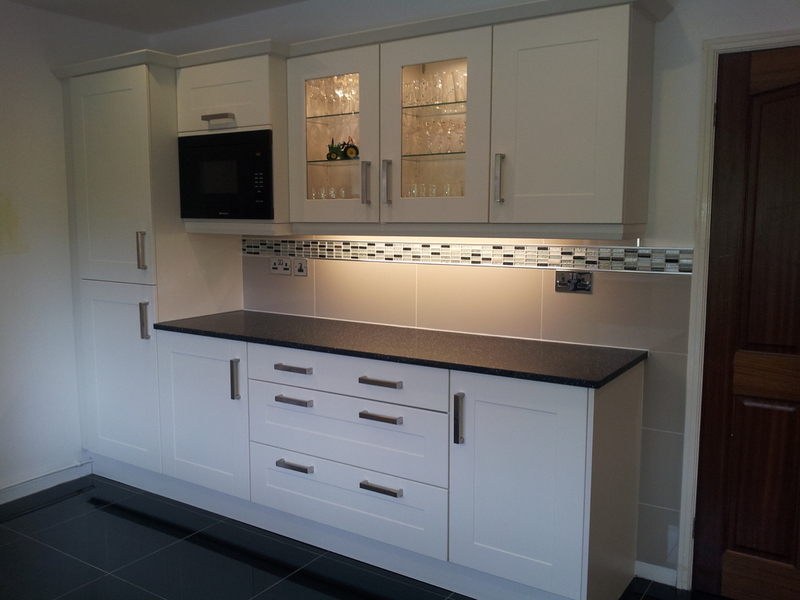 A stunning Rangemaster american style fridge freezer with drinks dispenser and icemaker complete the look. 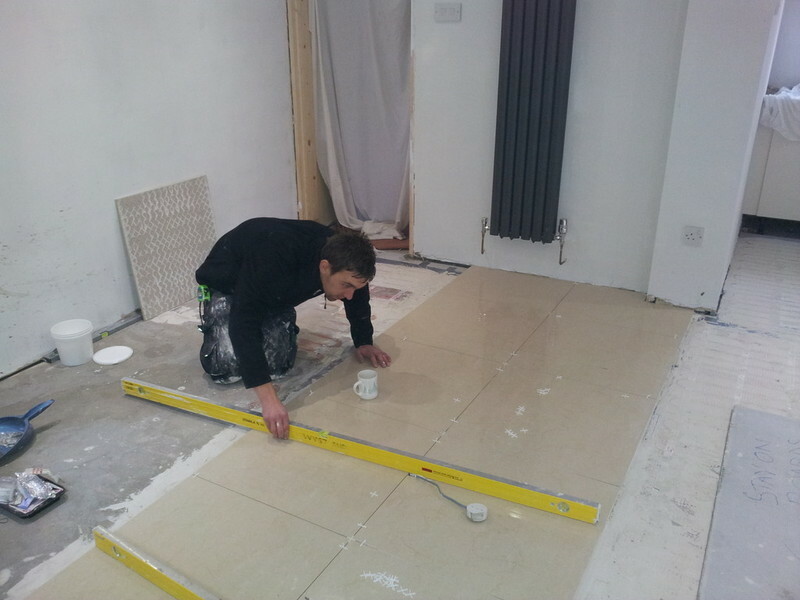 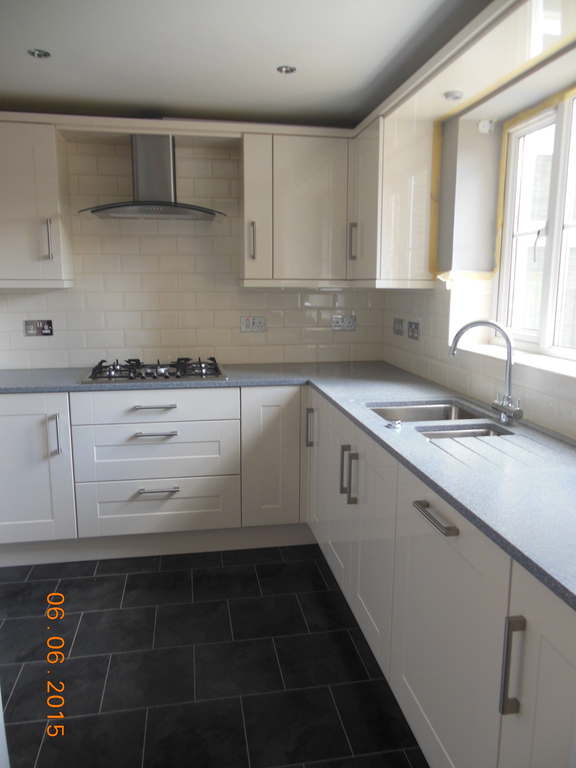 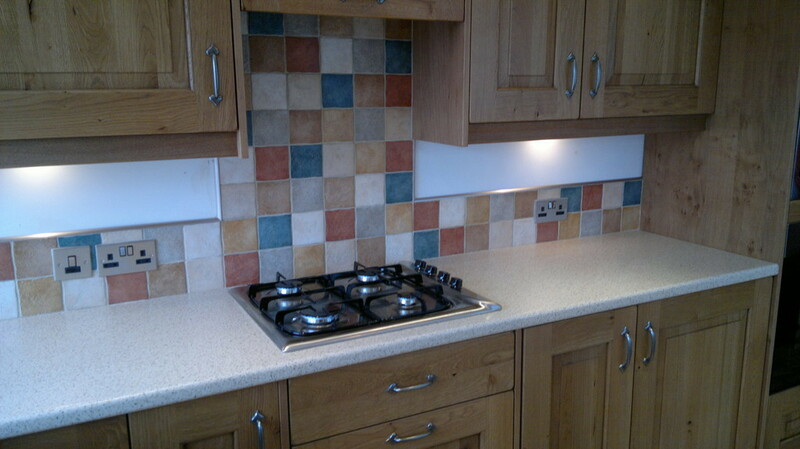 The floors were tiled in the kitchen and utility as well as alterations the the electrics and plumbing. 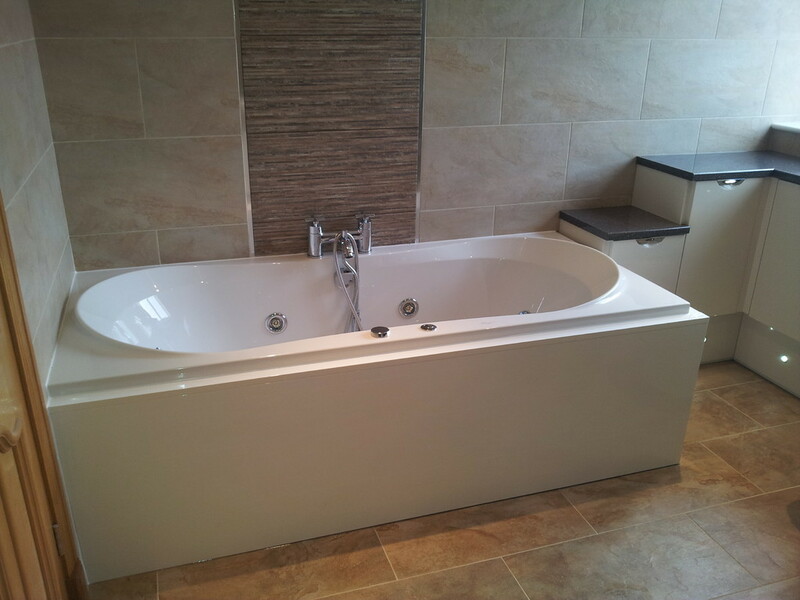 A large bathroom with a whirlpool bath, corner quadrant shower and fitted furniture from our Aquadi range. 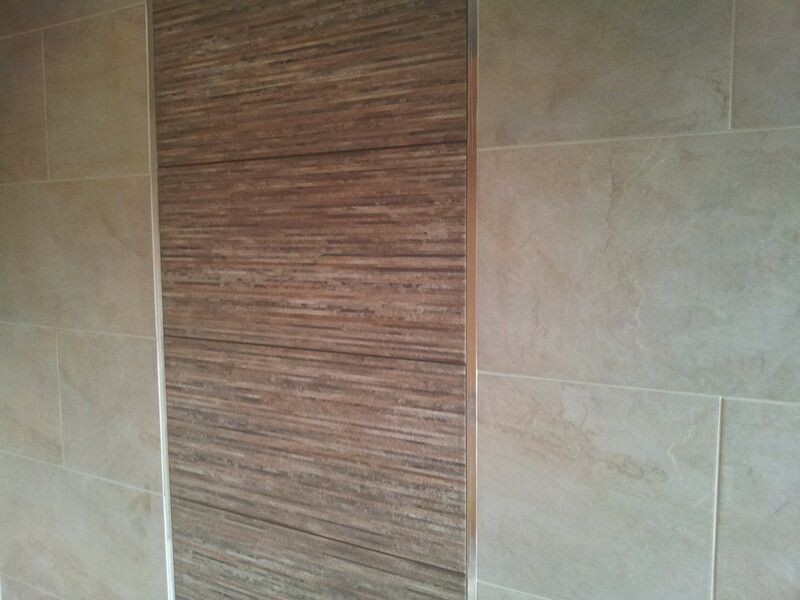 The walls and floor were completely tiled with a vertical border over the bath and the shower area tiled in a darker colour. 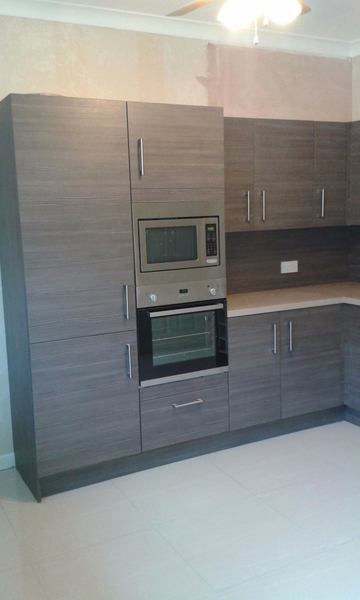 Gloss Latte cabinets with a brown quartz laminate worksurface give the feeling of luxury. 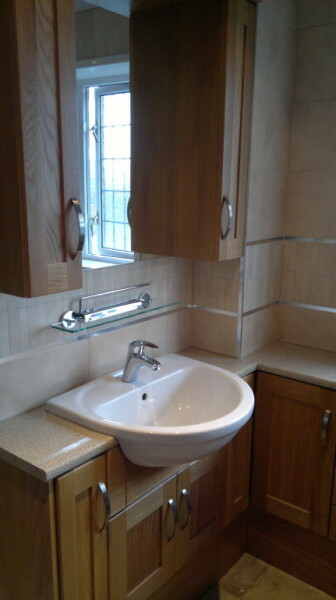 A semi recessed basin with back to wall WC. 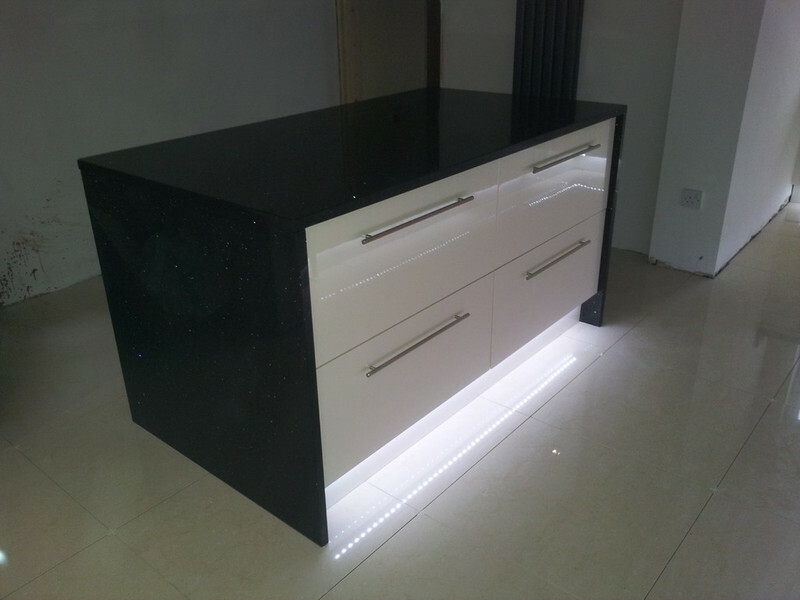 White LED plinth lighting was installed to provide mood lighting. 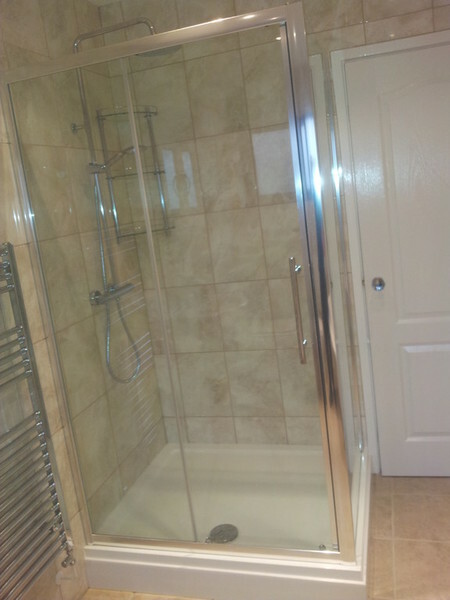 A Grohe mixer valve shower recessed into the wall and a chrome heated towel radiator. 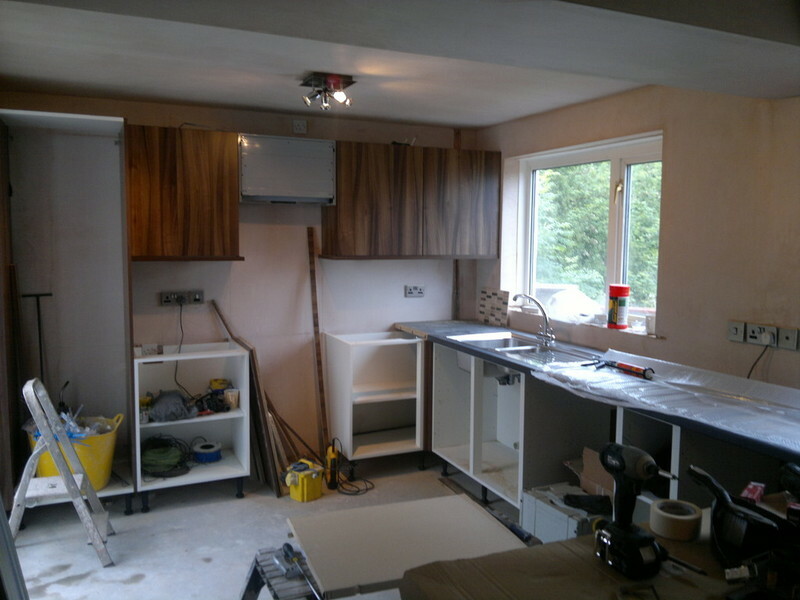 Large project where a new kitchen with an island, and a utility room were installed with Compaq Quartz worktops in the kitchen and laminate worktops in the utility room. 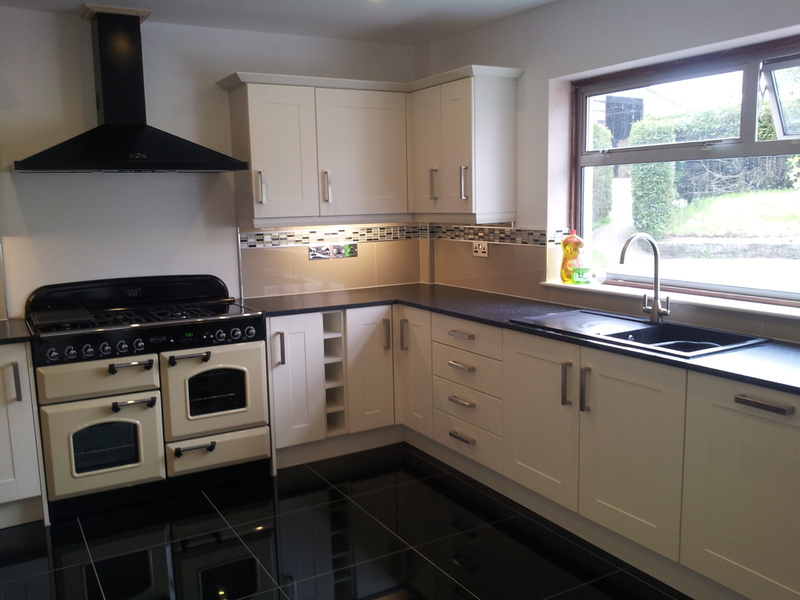 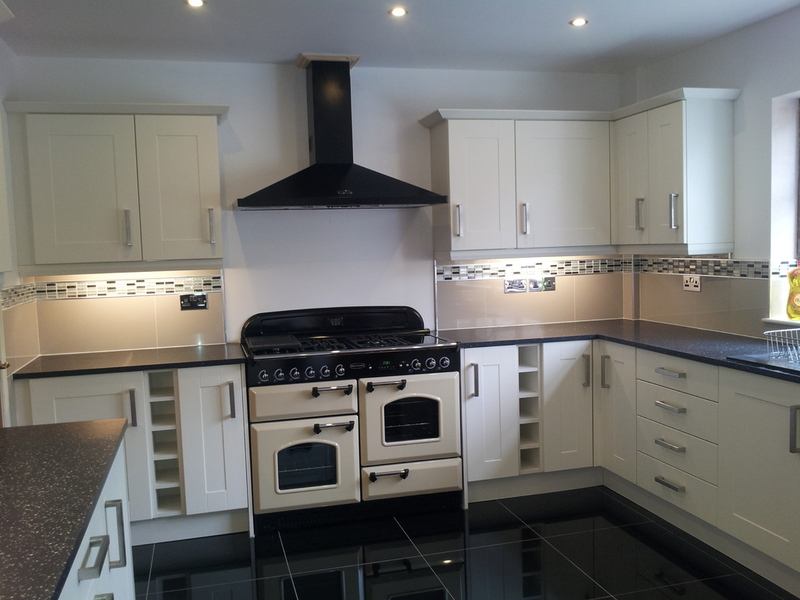 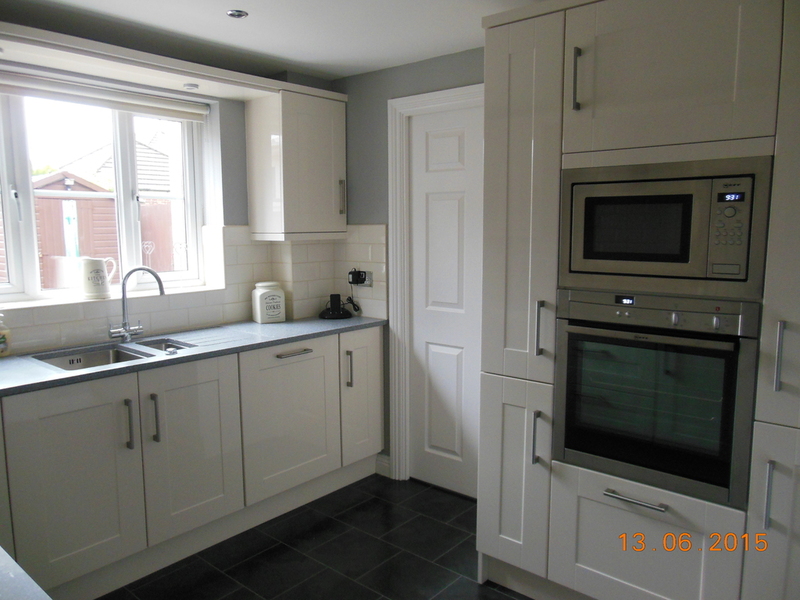 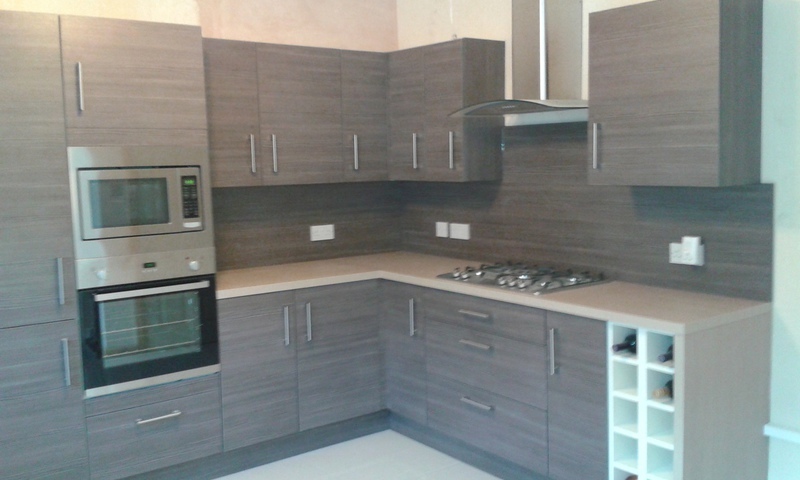 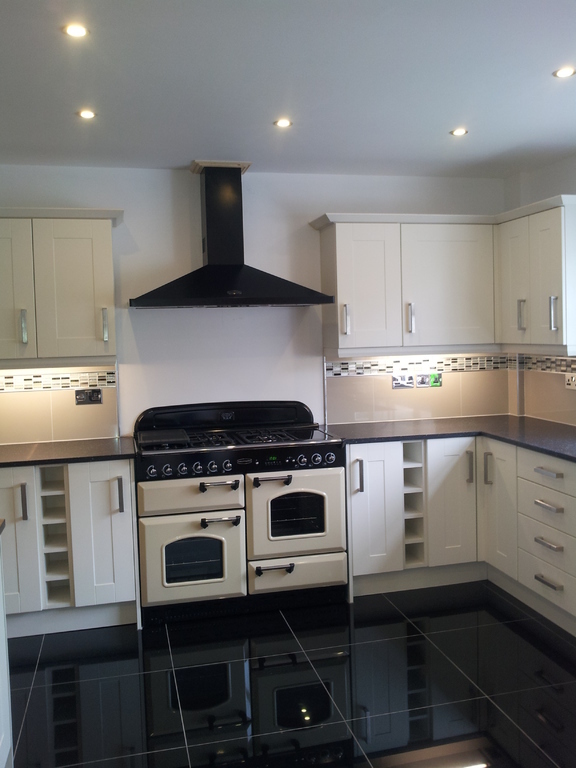 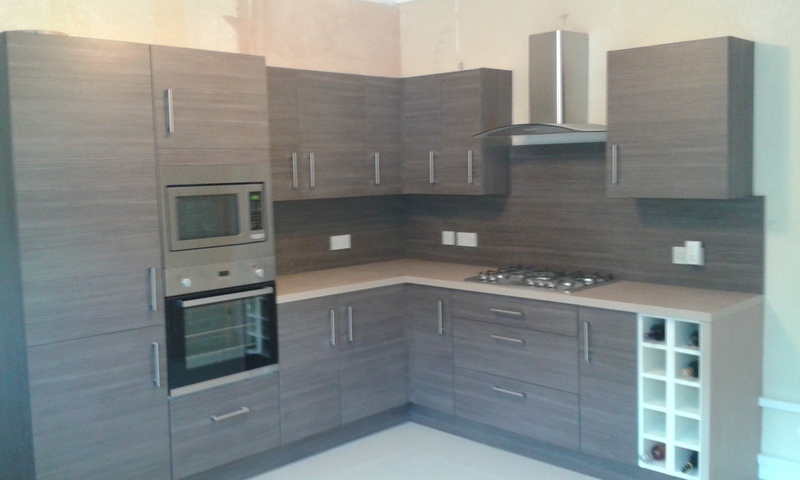 The Kitchen units are from the Gallery range and the door finish is the WOODBURY Ivory Gloss. 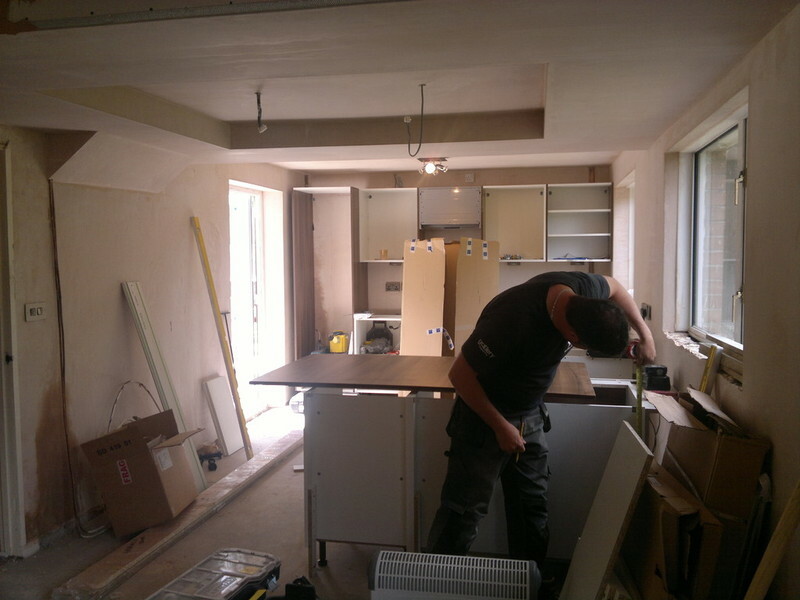 All electrical work was carried out by us including LED down lighters in the ceilings and new socket outlets and circuits for appliances. 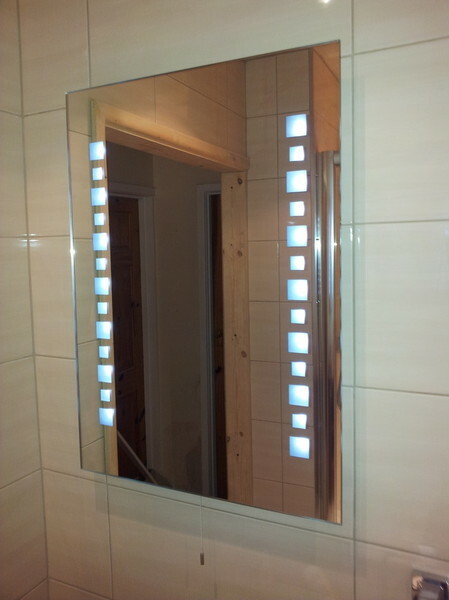 LED accent lighting was also fitted a plinth level. 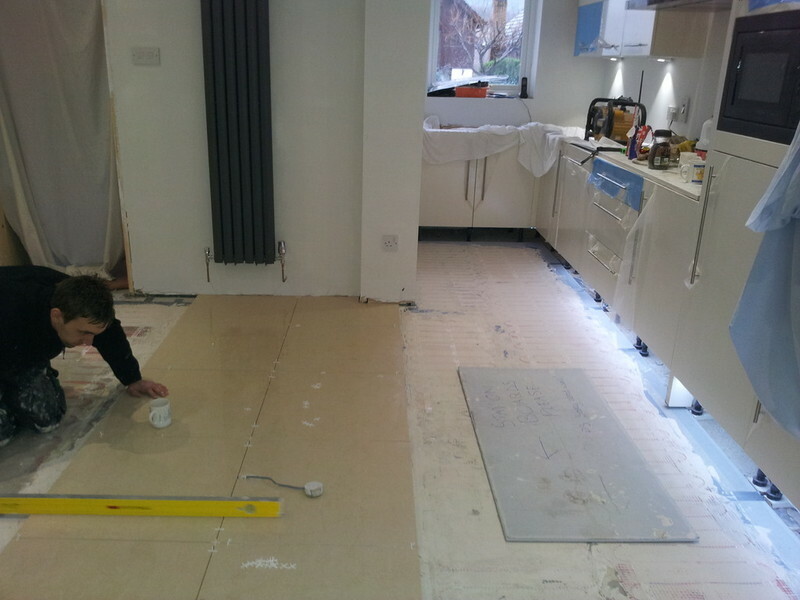 WARMUP under floor heating was also installed to the kitchen dining area prior to us tiling all floors in the kitchen and Utility room. 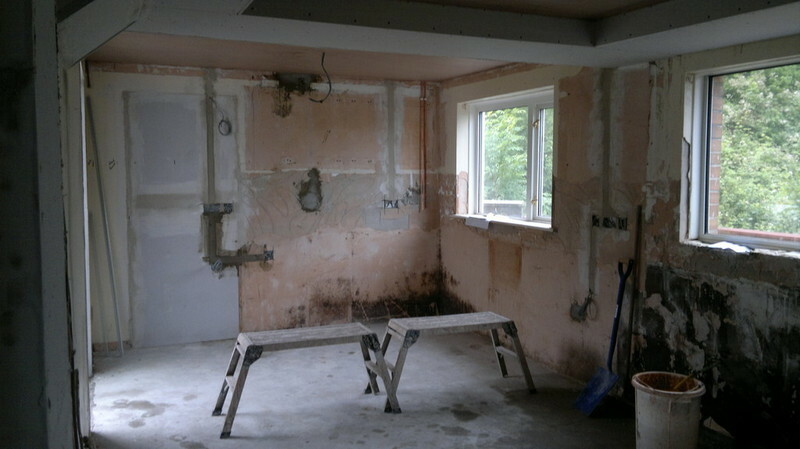 This job involved us taking down the walls between the existing WC and Bathroom and building one new shower room with WC. 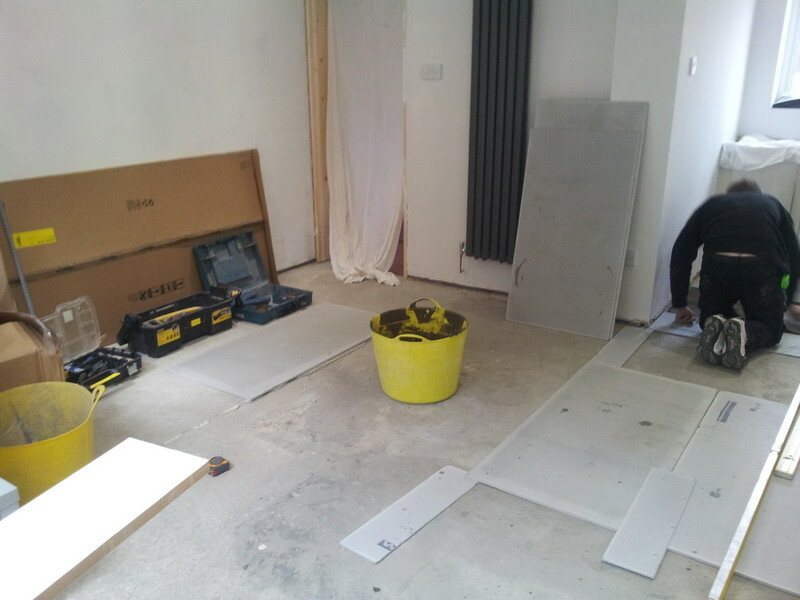 New stud partition walls were built with a new door way for easier access from the landing for a wheelchair. 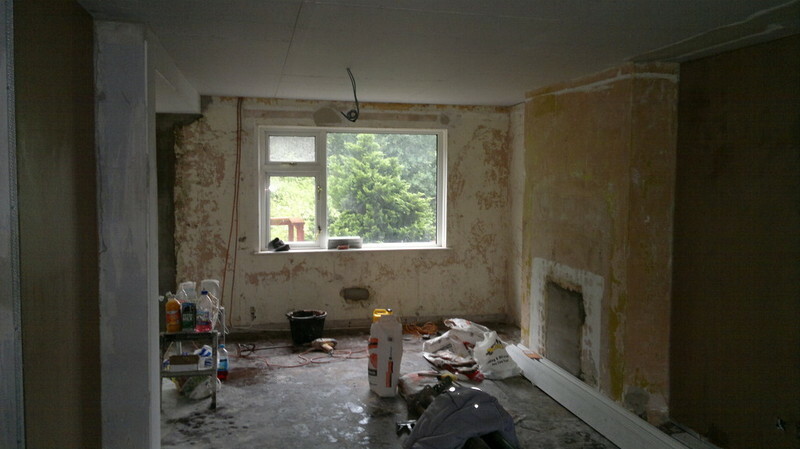 The walls and ceiling were replastered and low voltage down lighters installed in the ceiling. 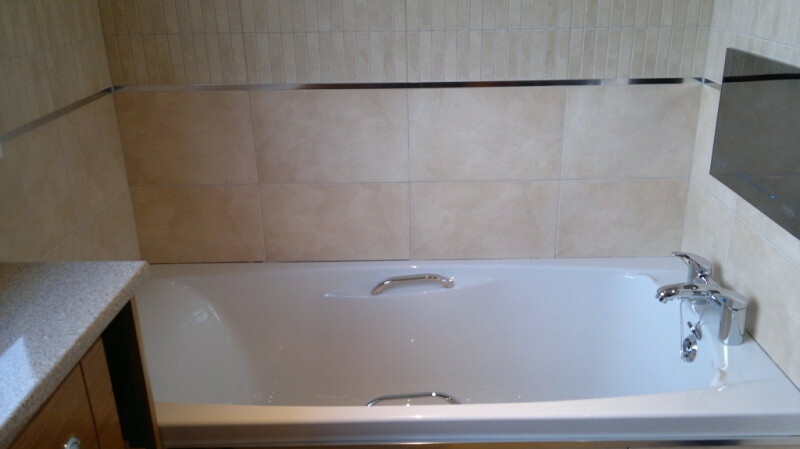 The floor and walls are completely tiled from top to bottom. 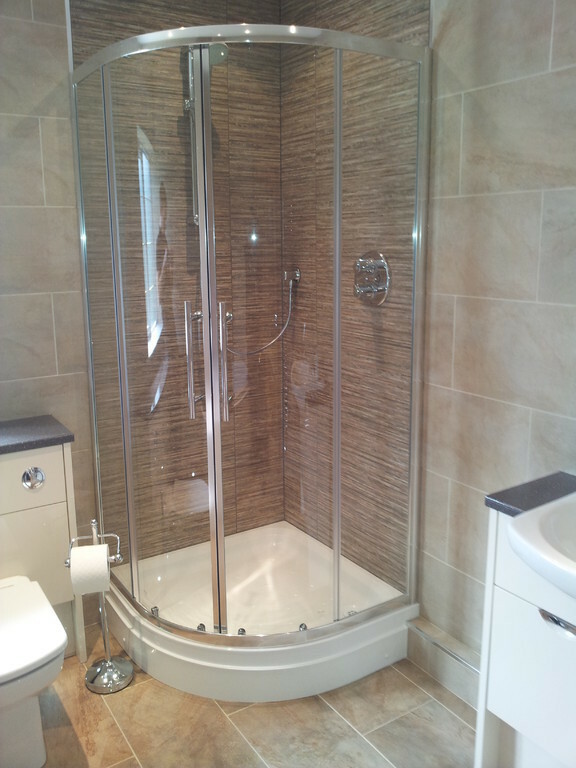 A sliding door to the shower and a thermostatic bar shower with drench head and handset. 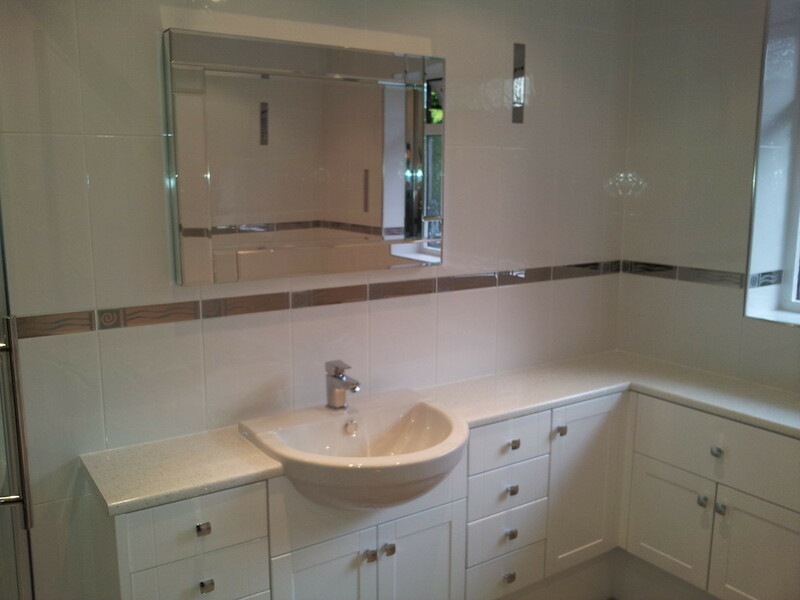 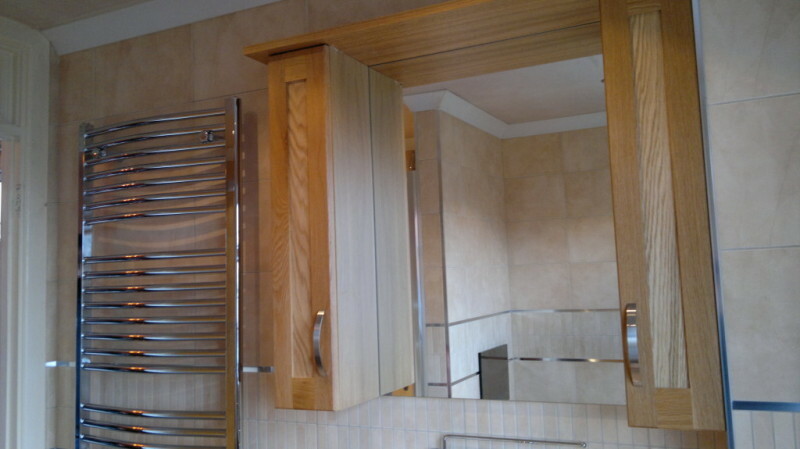 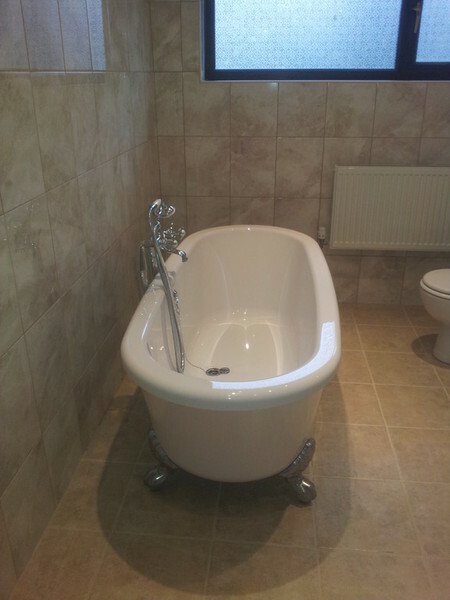 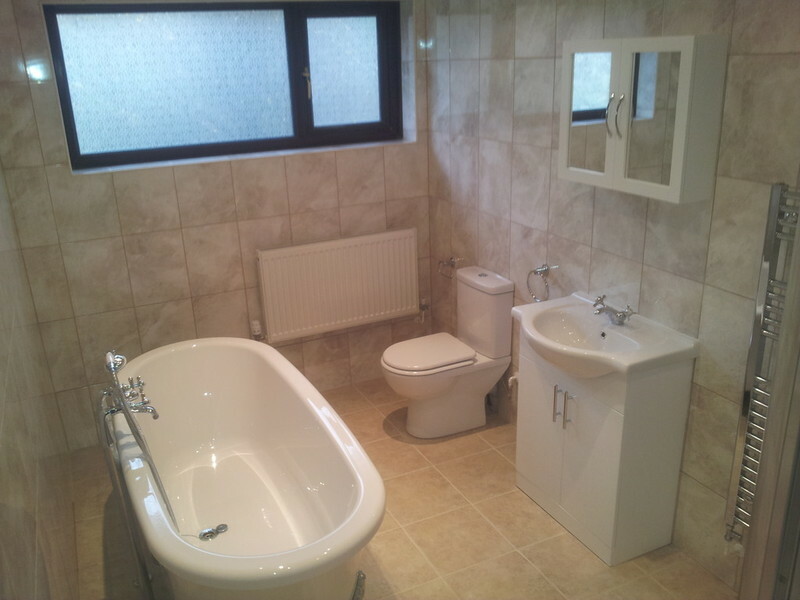 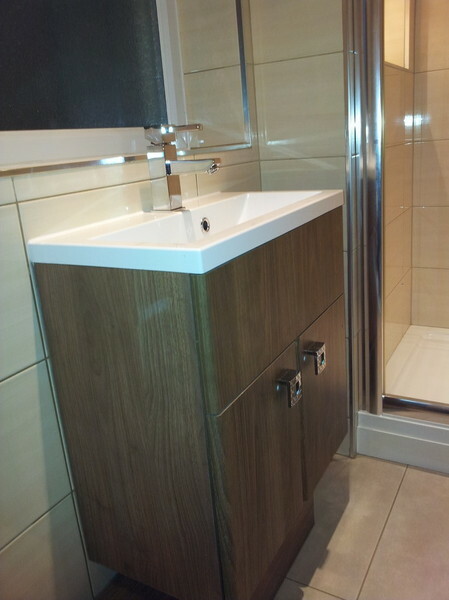 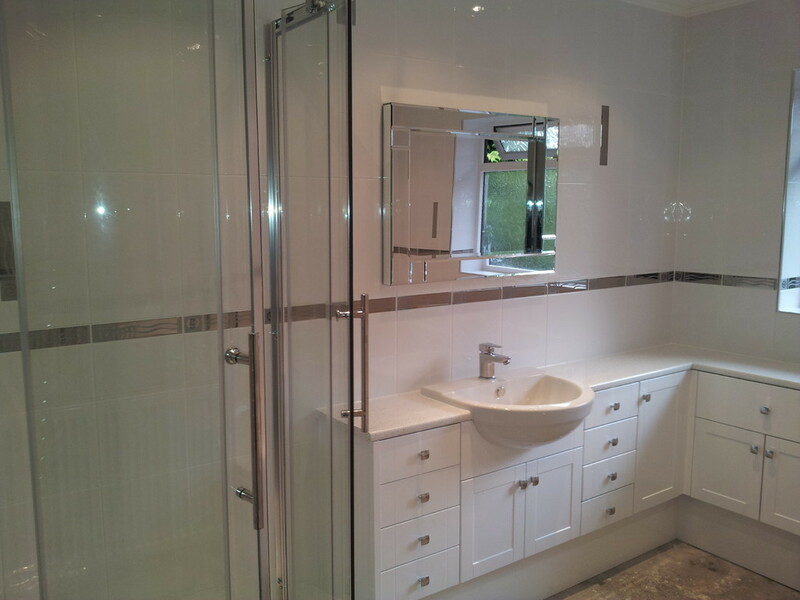 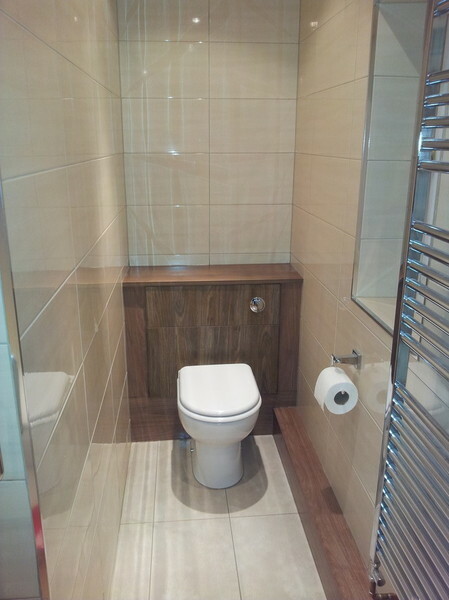 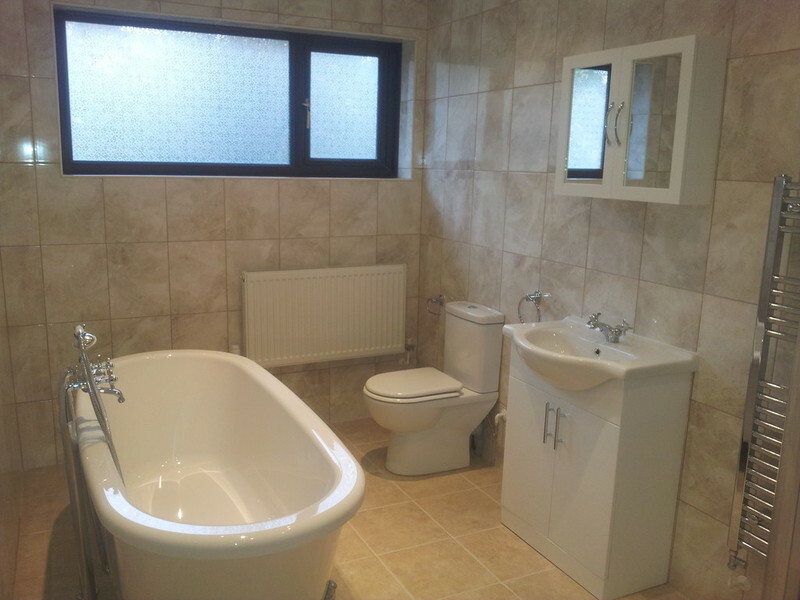 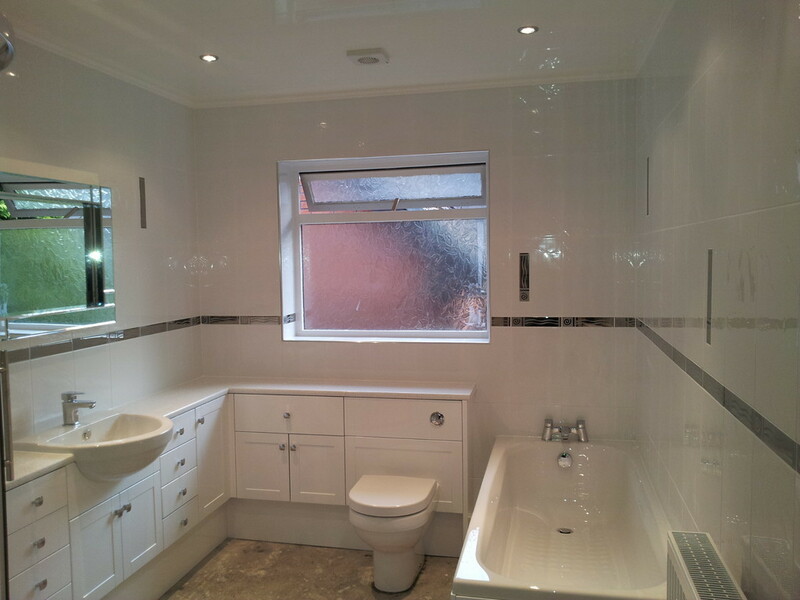 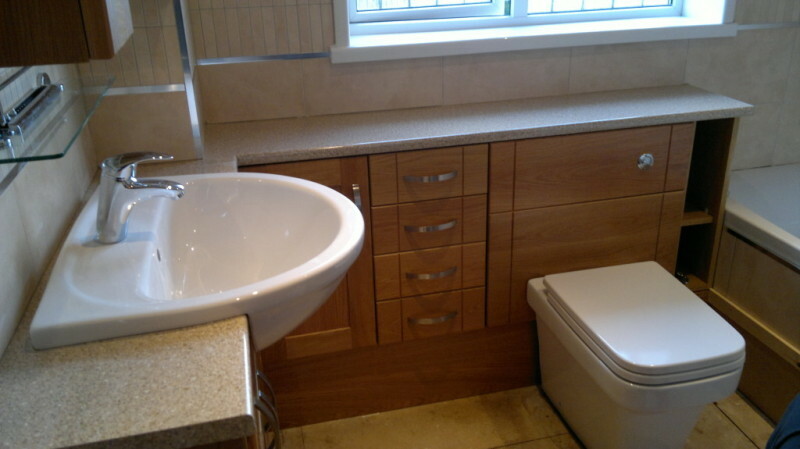 Fitted furniture was supplied from the Aquadi range and white sanitary ware. 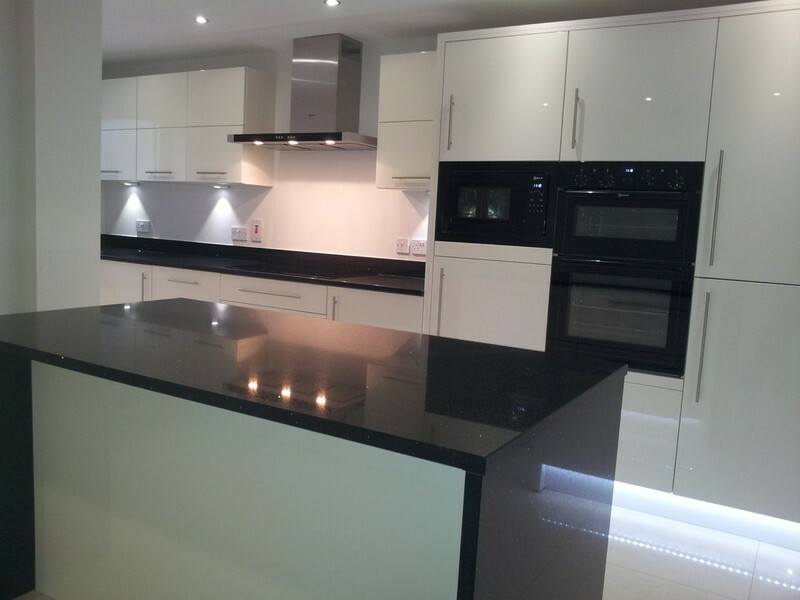 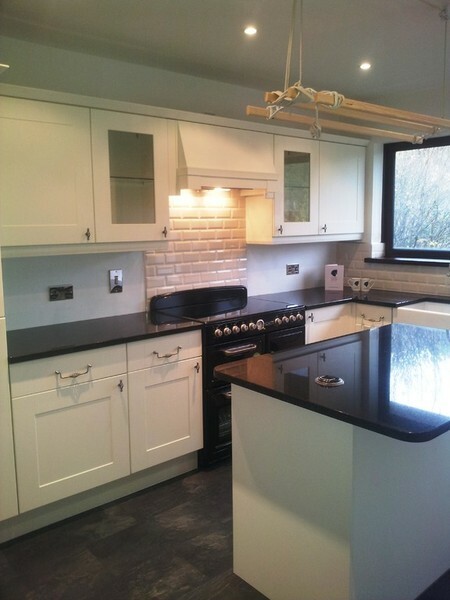 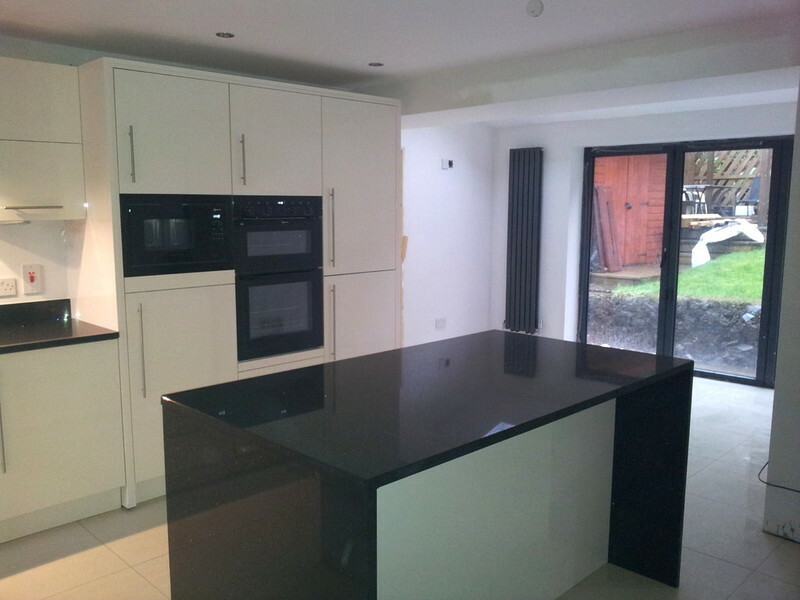 This was a large project where we installed a new kitchen with granite worksurfaces and tiling above. 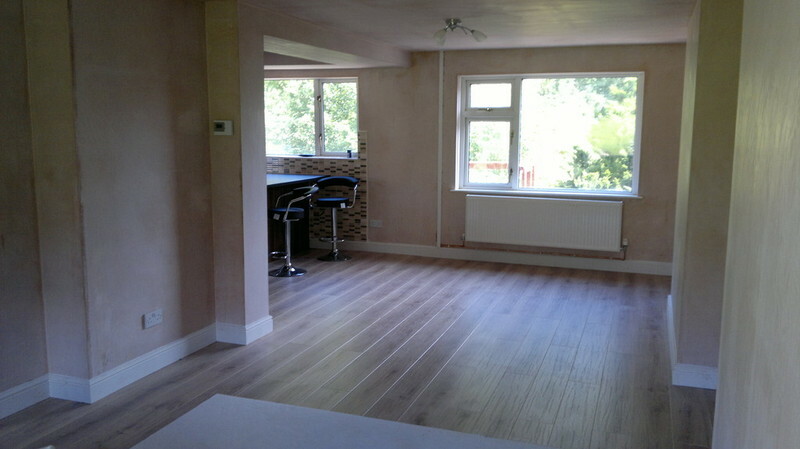 A new laminate floor, new plastered ceilings and recessed down lighters and other electrical work. 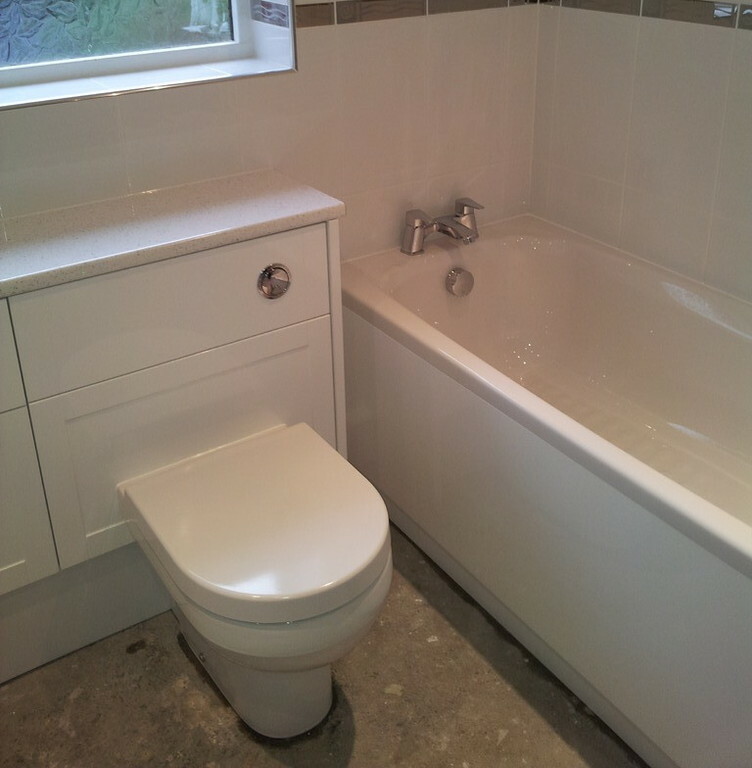 A new bathroom was also installed with a free standing bath with a shower tap, a shower tray and enclosure and WC and basin unit. 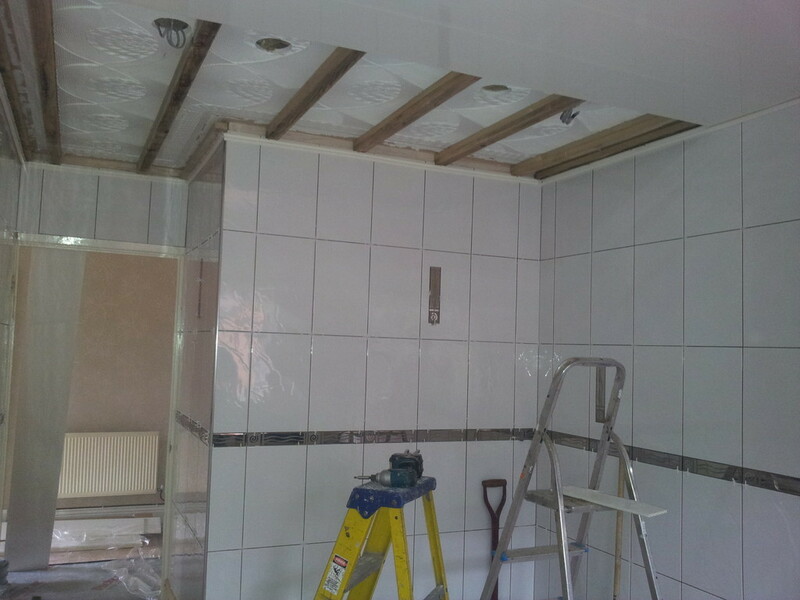 The walls and floor were tiled and the ceiling replastered with down lighters fitted. 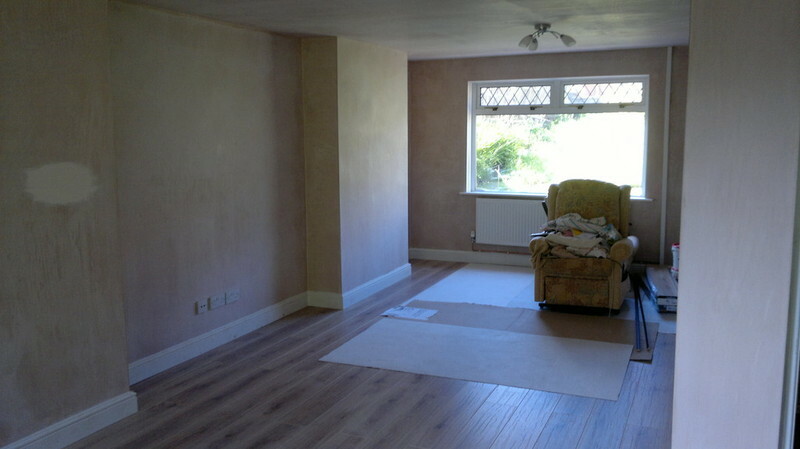 The living room and hall had new laminate flooring through out, and the ceilings replastered with down lighters. 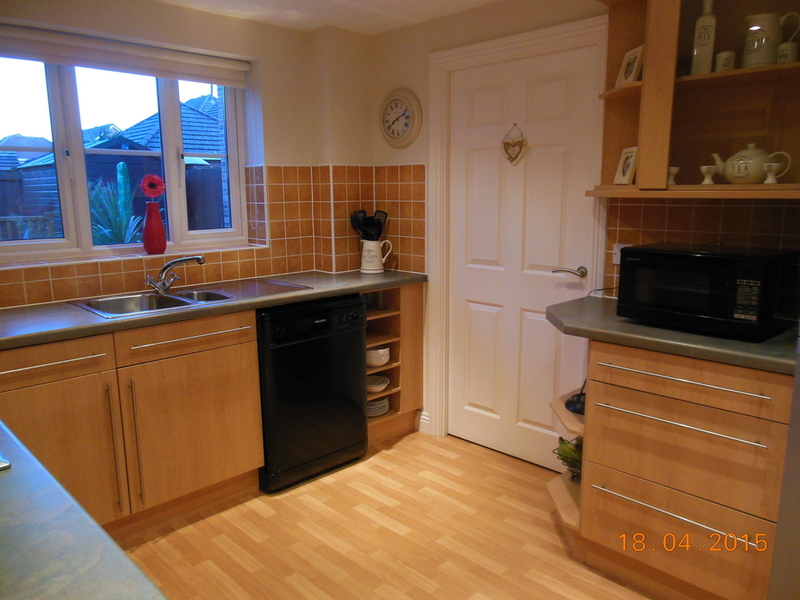 New doors and hardware were fitted and a new consumer unit installed in the garage. 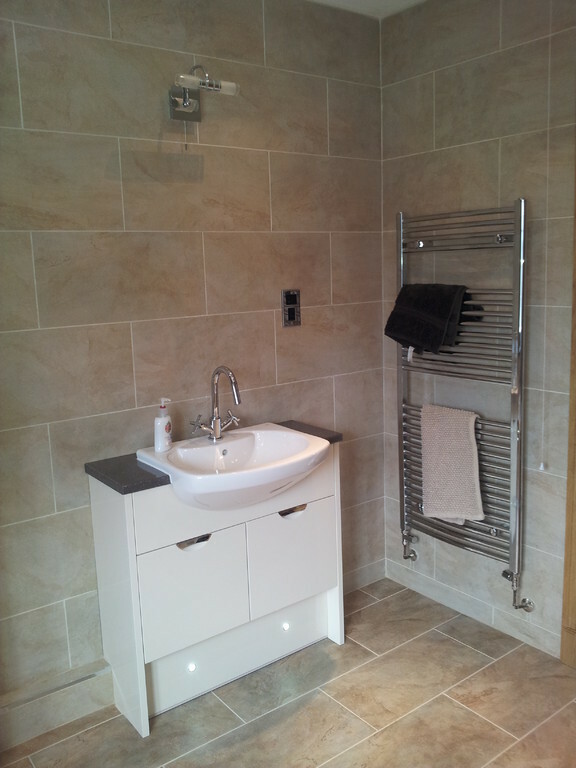 A new bathroom installation where we fitted pvc ceiling board cpmplete with chrome down lighters and an extractor fan. 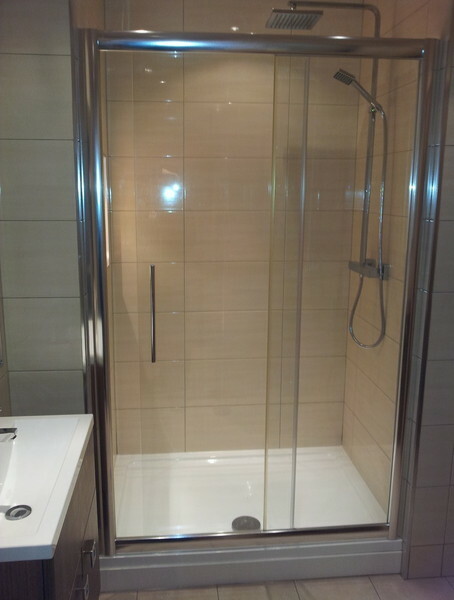 A new 1200 x 900 shower tray and sliding door enclosure. 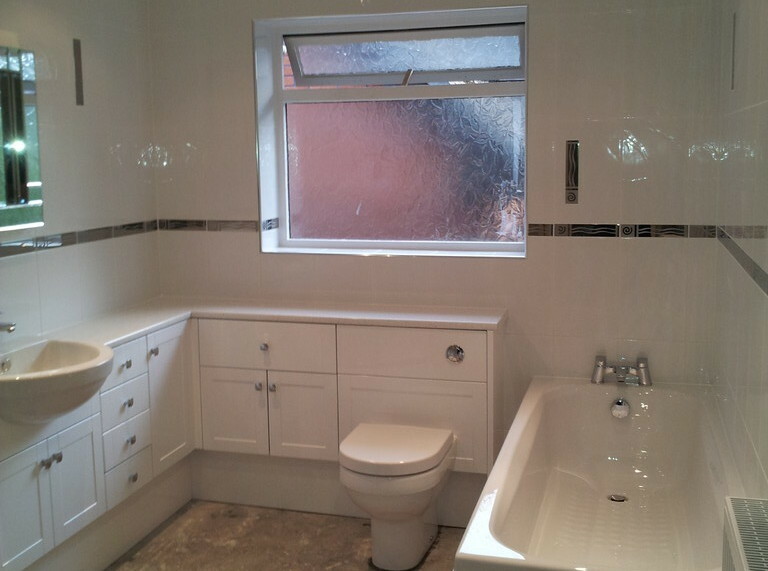 A new bath with gloss white panels and fitted furniture from the Aqaudi range with the Salerno gloss white shaker style door. 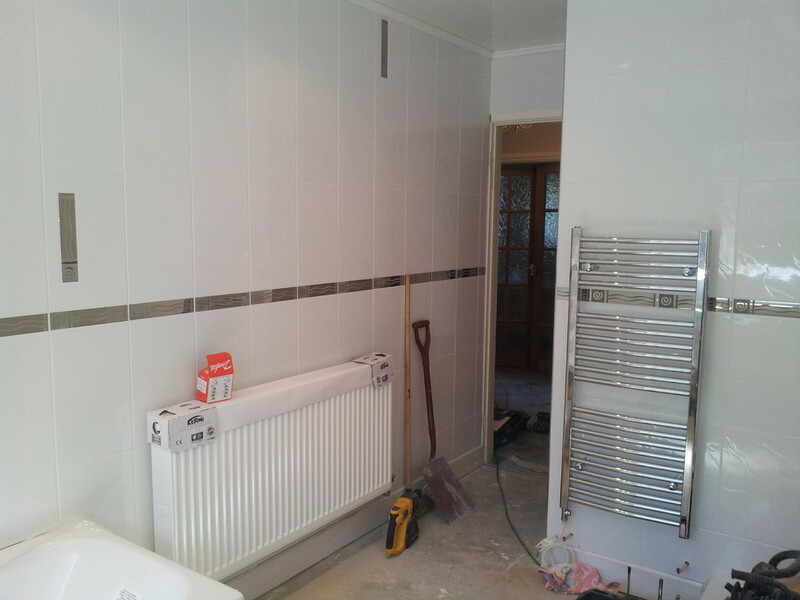 The walls were retiled from floor to ceiling, and a new double radiator and a chrome towel radiator were also installed. 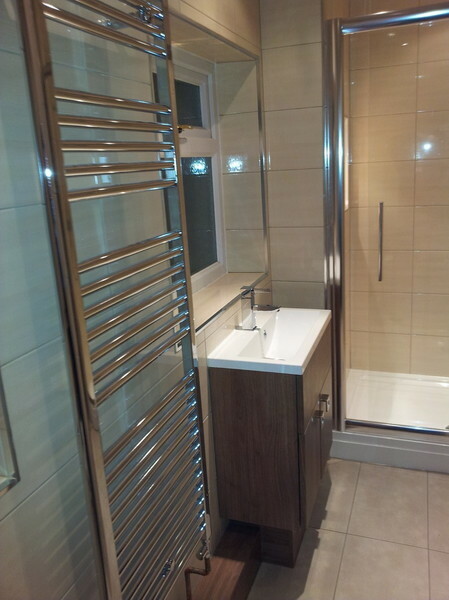 The chrome radiator was also fitted with an electric element so that it can be used in the summer months when the central heating system is off. 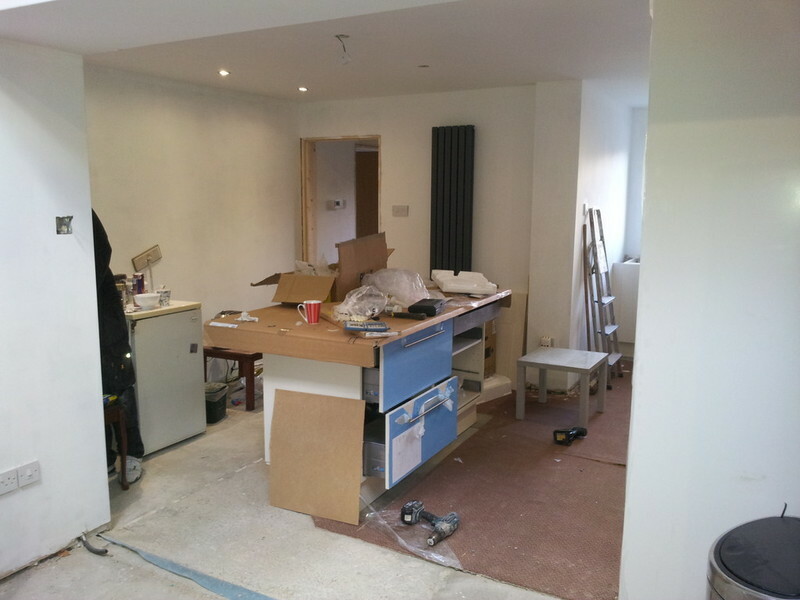 KITCHEN, Building Work and New Boiler Installation. 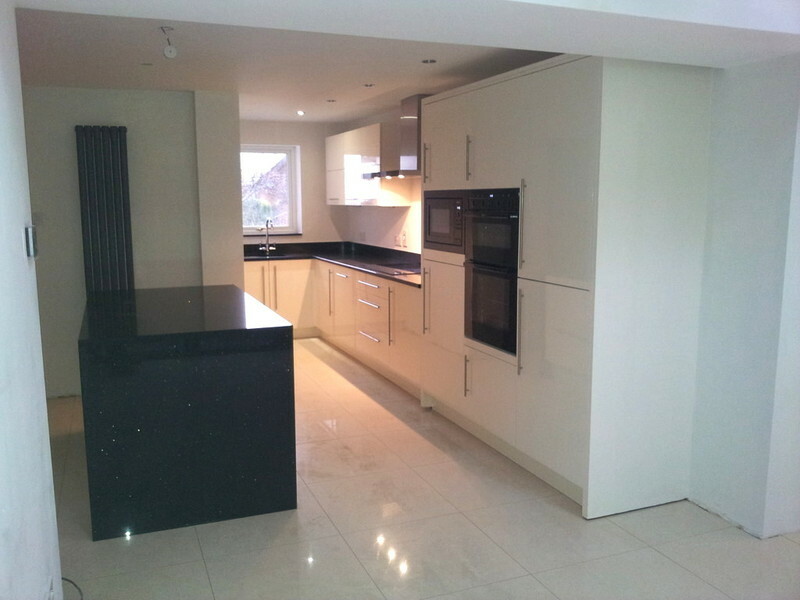 A large project where the existing kitchen, rear living room and front living room were converted to one large open plan living space. 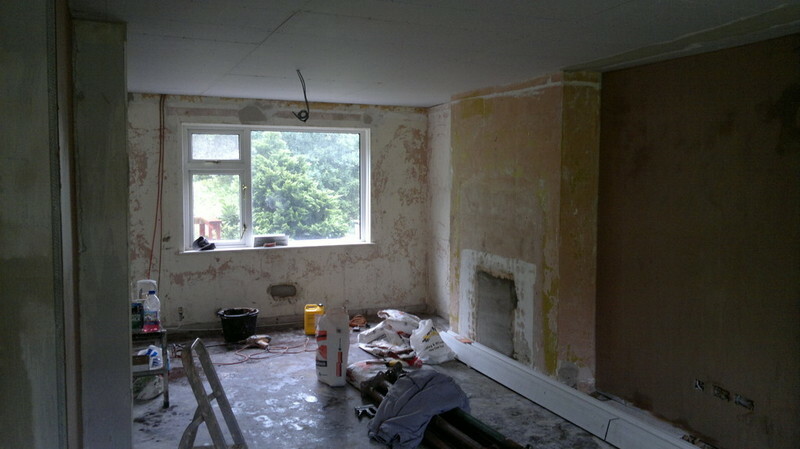 The ceilings were renewed and all the walls and ceilings were plastered. 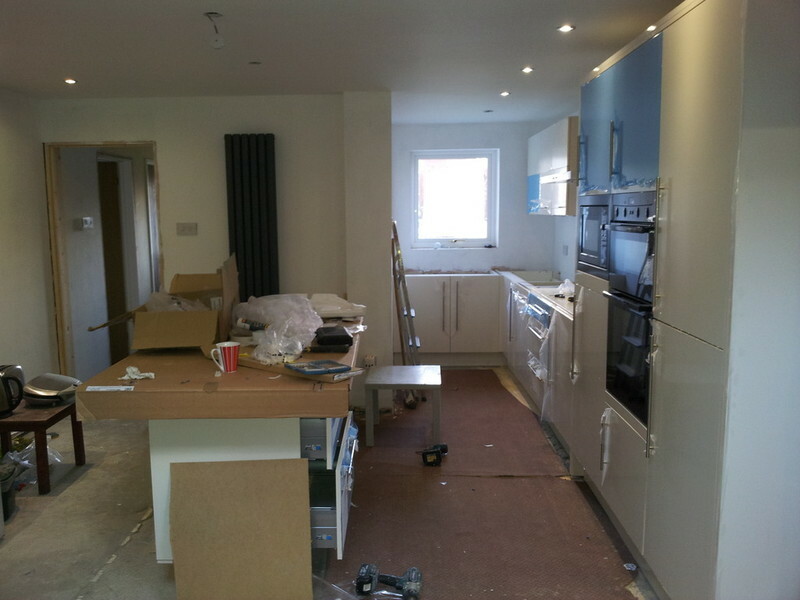 The entire ground floor was rewired with new lighting and power circuits. 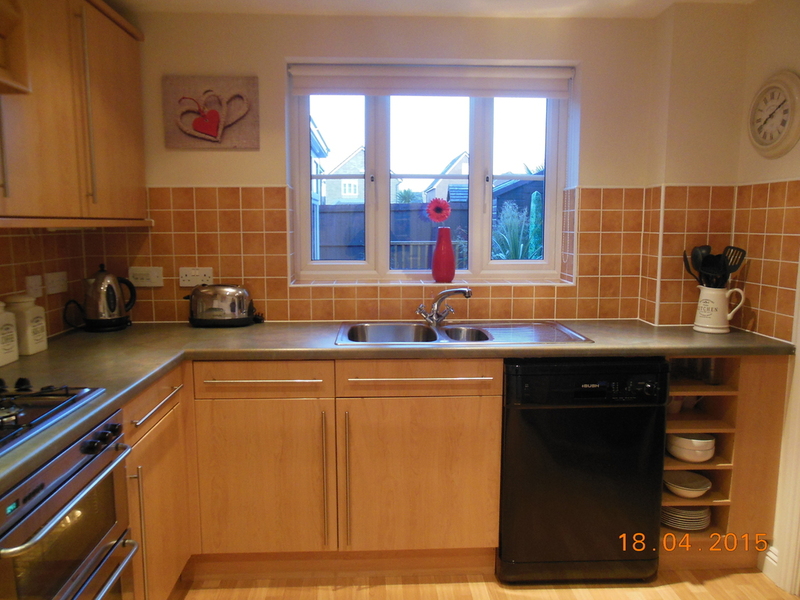 The existing back door was removed and the opening blocked up, and also the window taken out with French doors fitted in their place. 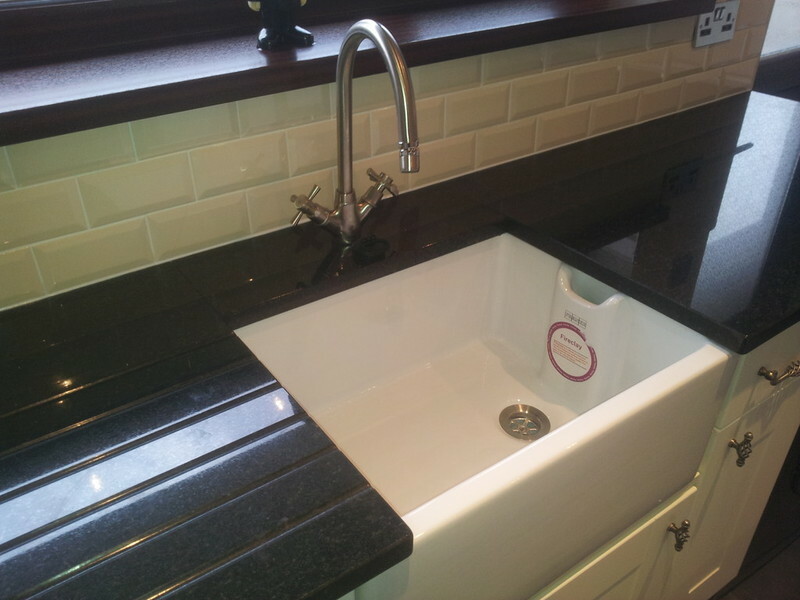 A new kitchen from our lifestyle range with the Kempton door was installed with a Franke sink and tap. 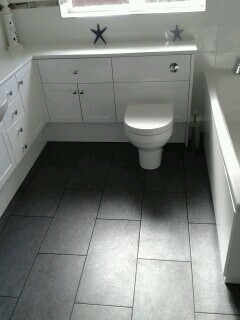 Tiling above the worktops and laminate flooring with new skirtings complete the job. 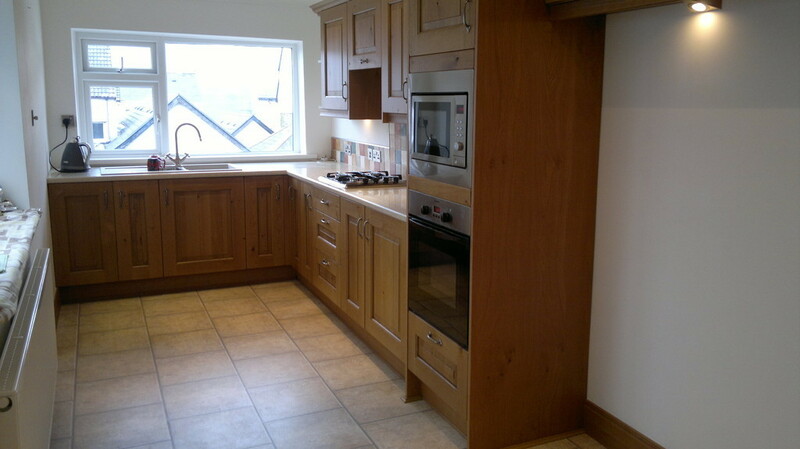 This Kitchen is called STAMFORD and is a solid oak door and is from our GALLERY range by Symphony. 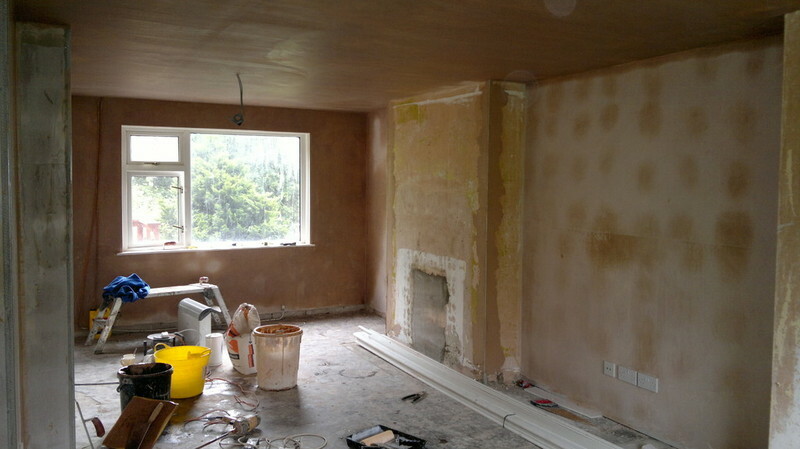 The ceilings and walls were replastered and electrics altered prior to the new kitchen being installed. 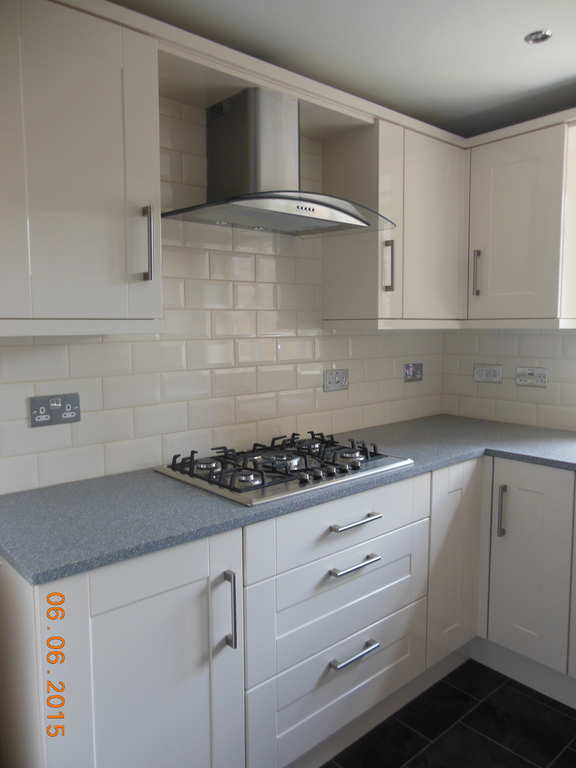 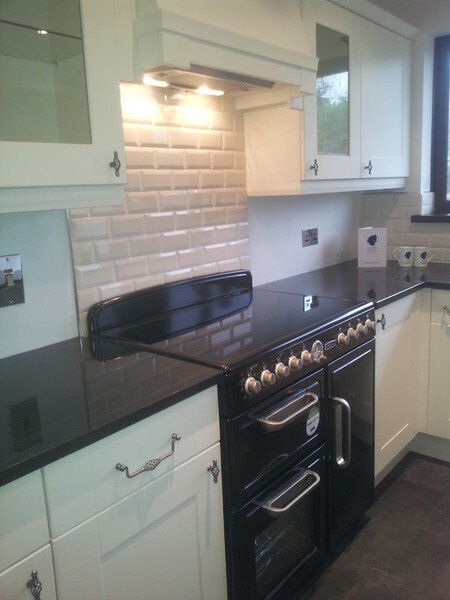 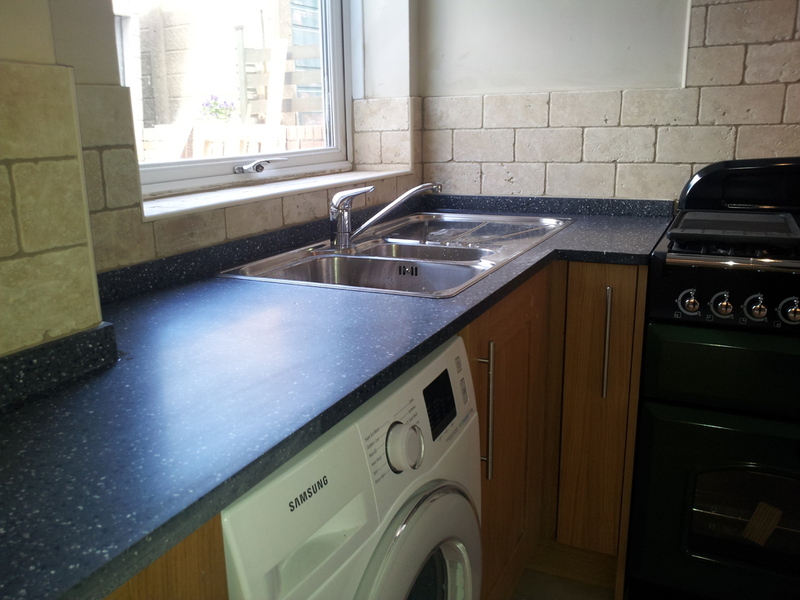 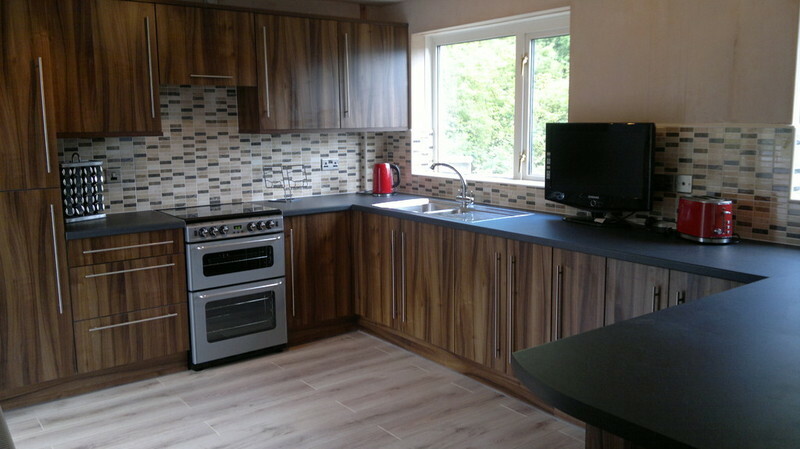 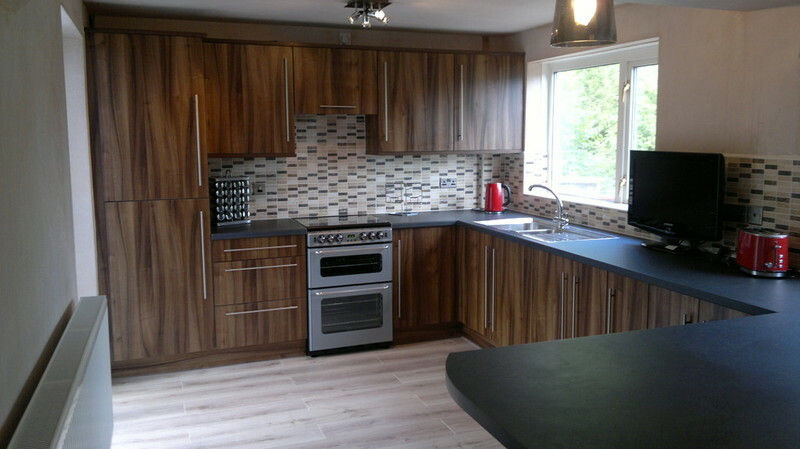 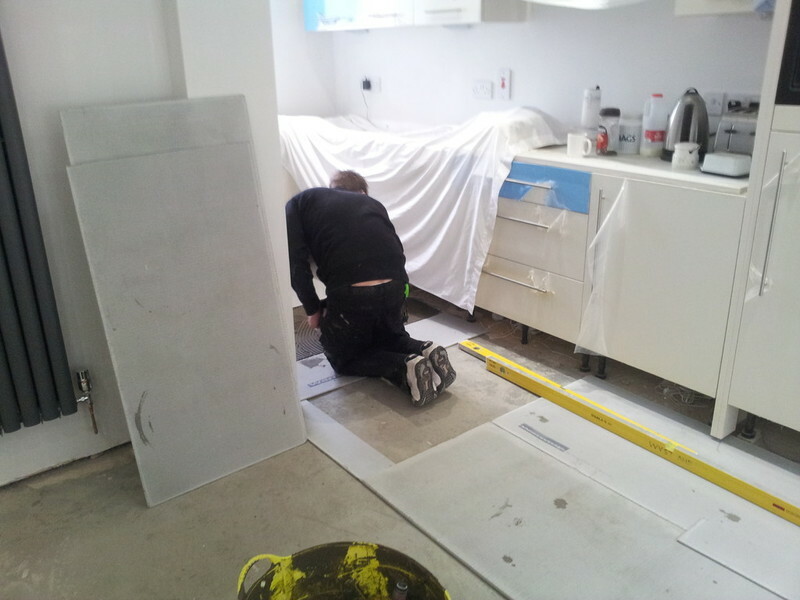 The wall was tiled above work surfaces to create a splashback and the floors were covered with new laminate flooring. 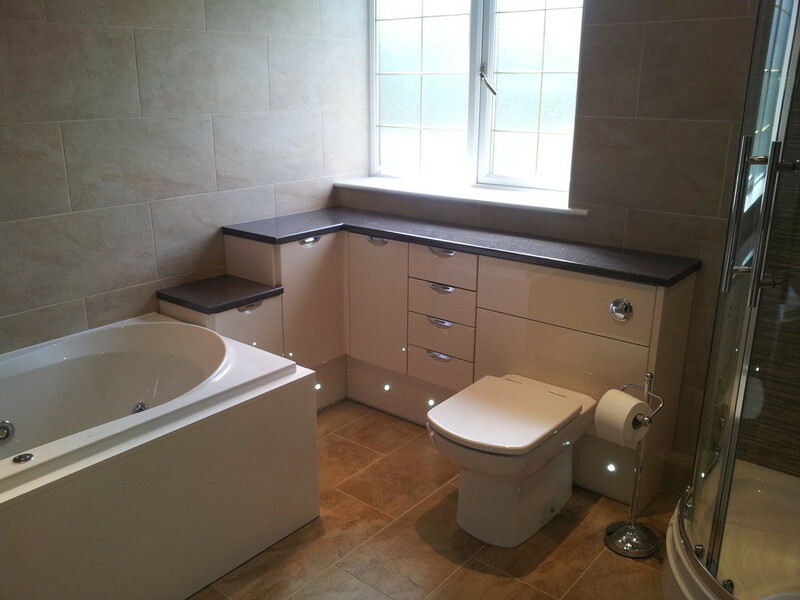 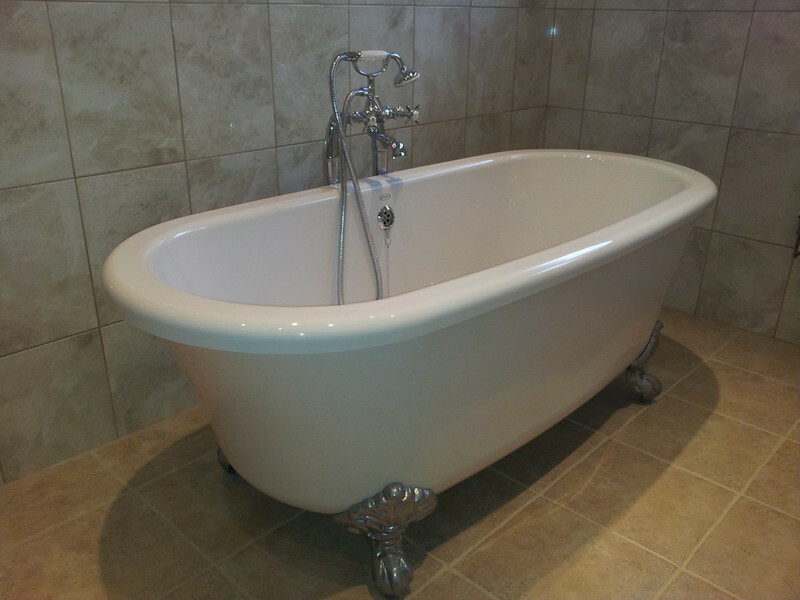 A full bathroom installation with a separate bath and shower, and fitted furniture from our Woodstock range of cabinets. 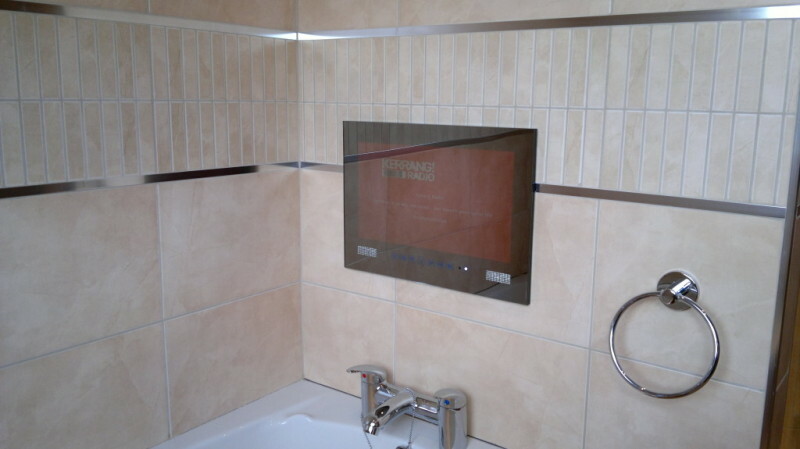 The ceilings were replastered and low voltage down lighters installed along with a bathroom television recessed into the wall prior to the walls being tiled.